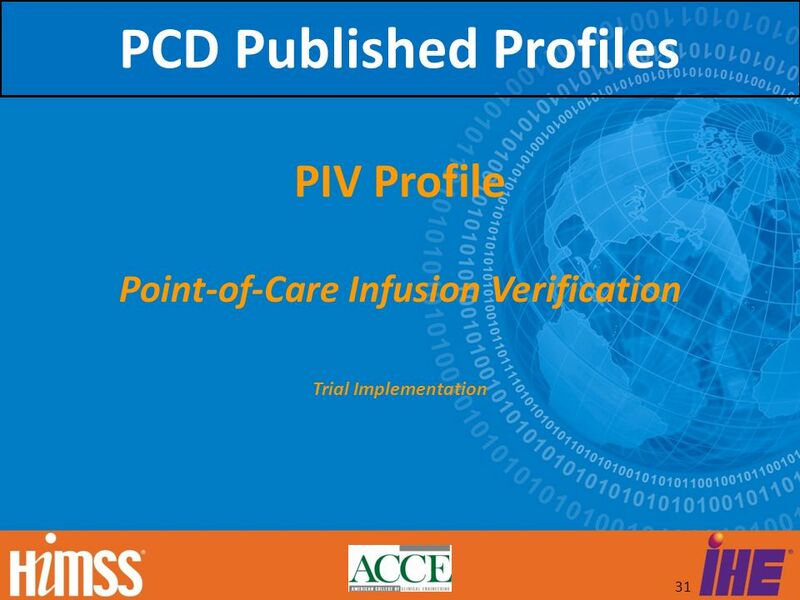 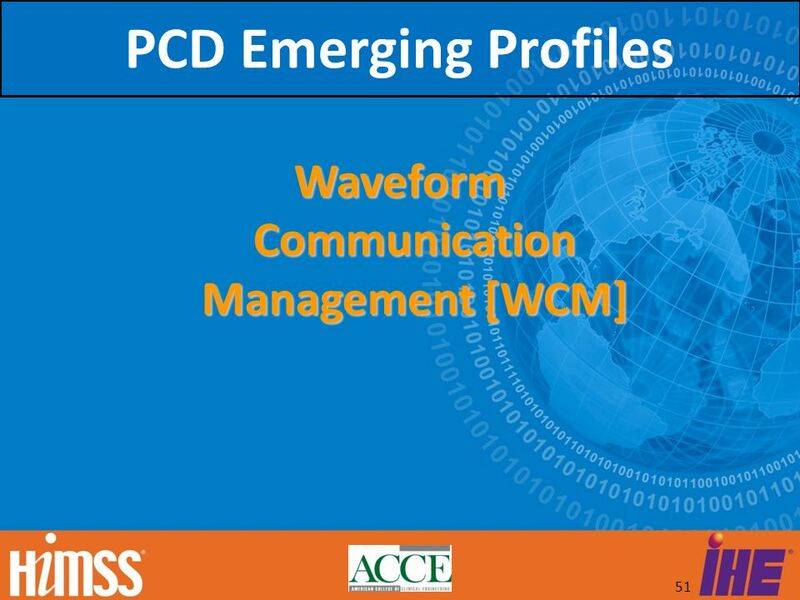 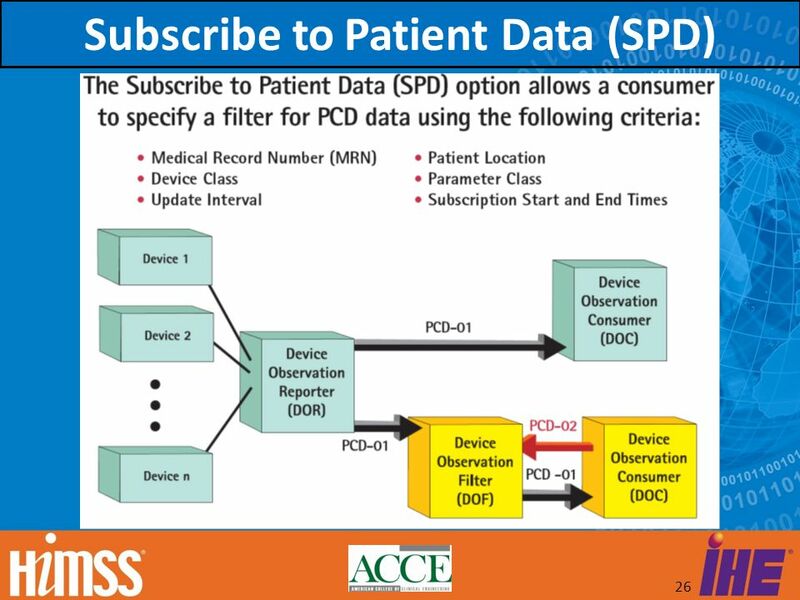 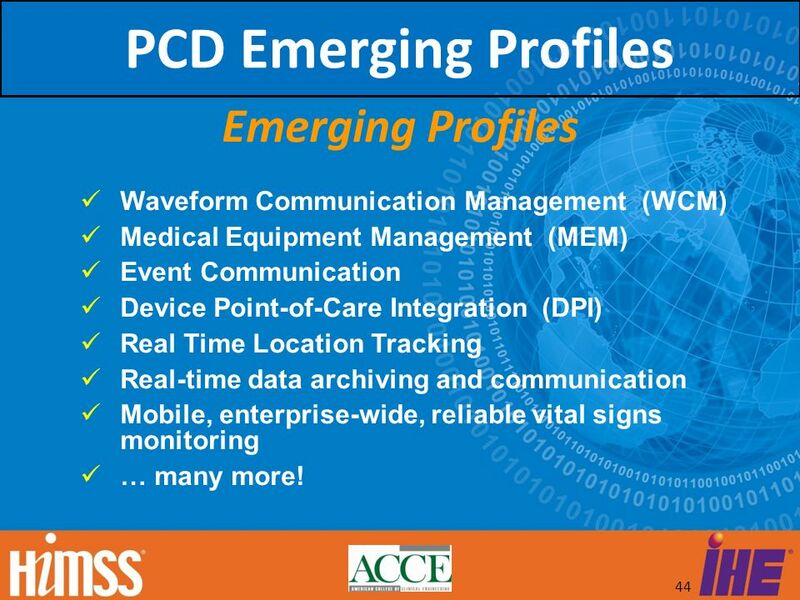 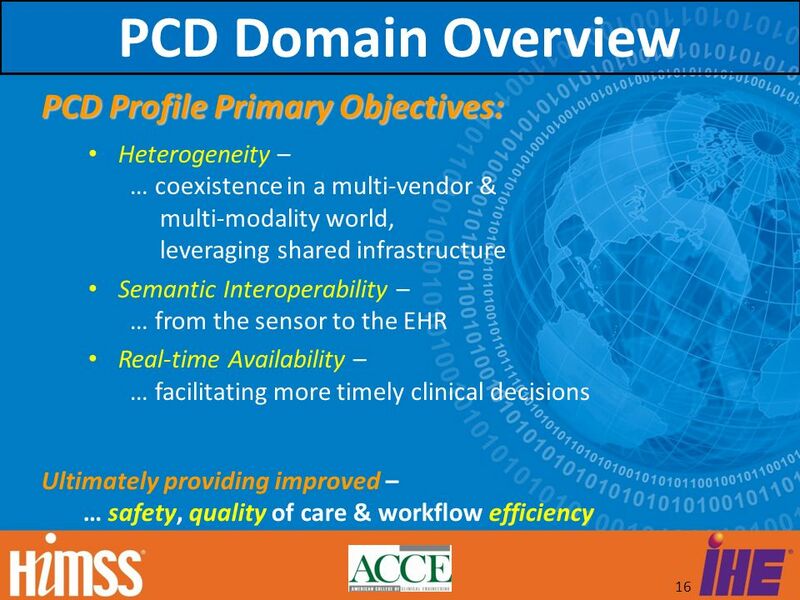 23 DEC Profiles PCD DEC profile supports the communication of patient clinical data from devices. 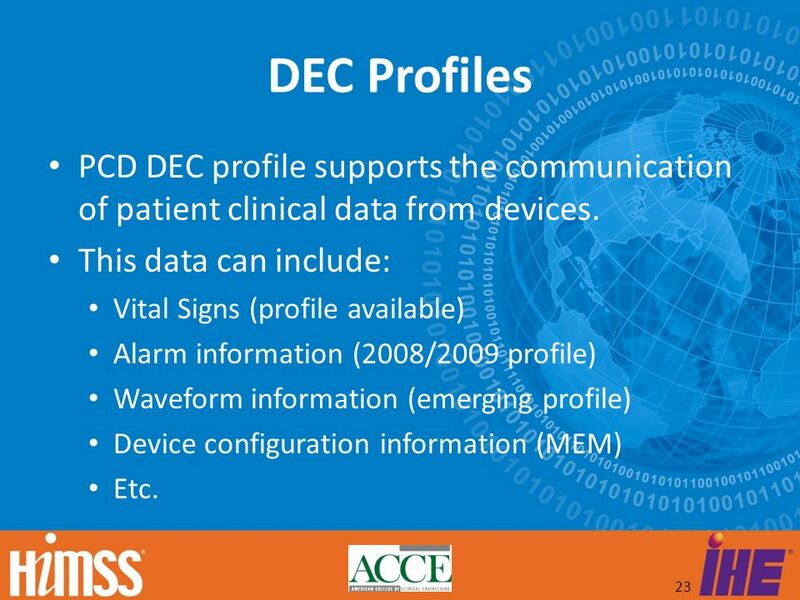 This data can include: Vital Signs (profile available) Alarm information (2008/2009 profile) Waveform information (emerging profile) Device configuration information (MEM) Etc. 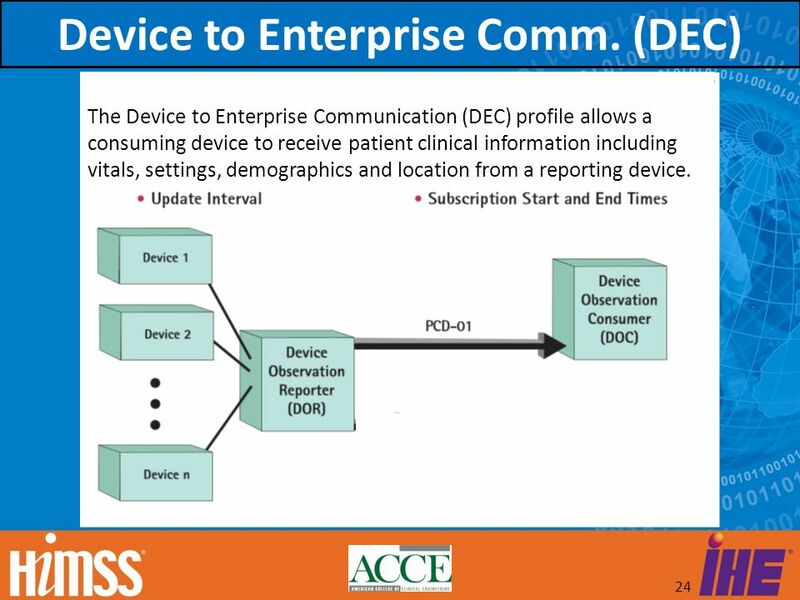 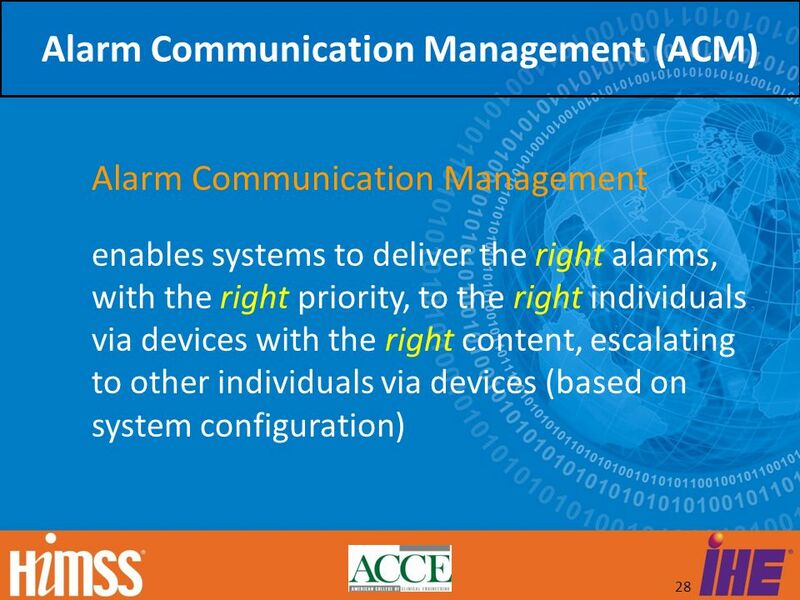 The Device to Enterprise Communication (DEC) profile allows a consuming device to receive patient clinical information including vitals, settings, demographics and location from a reporting device. 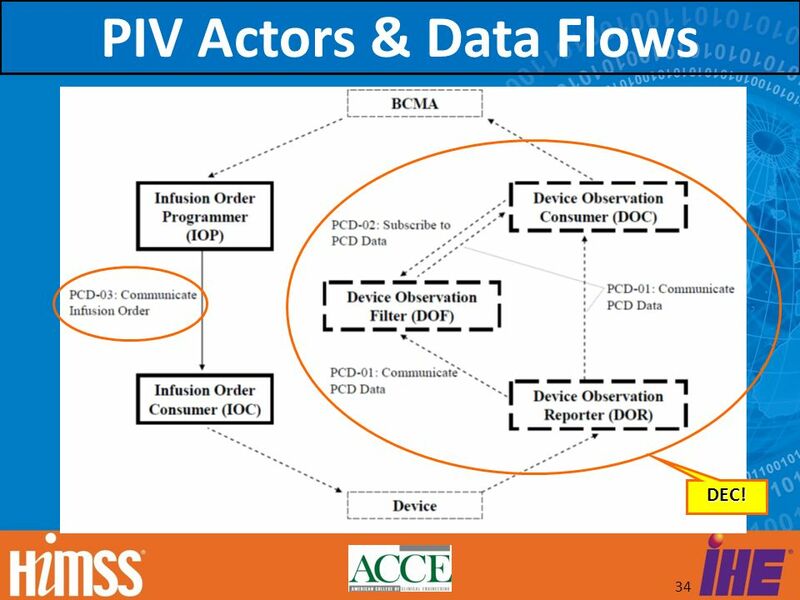 34 PIV Actors & Data Flows DEC! 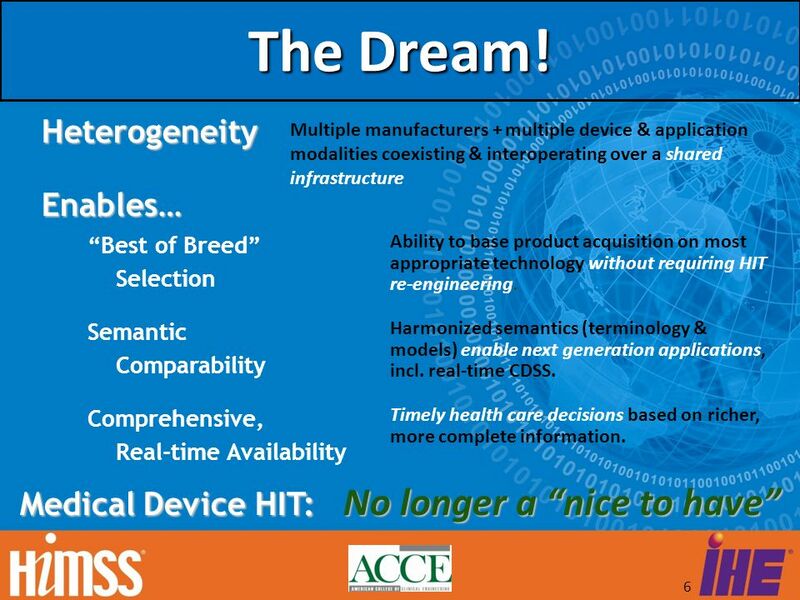 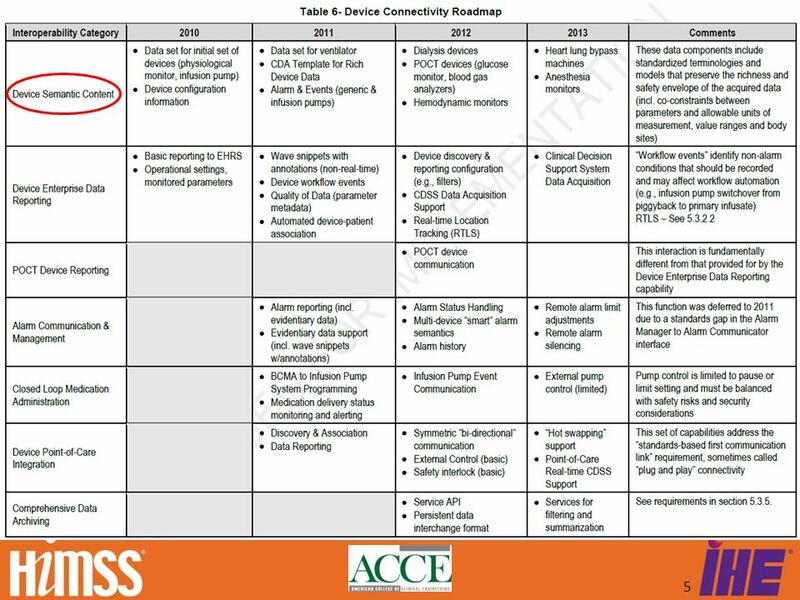 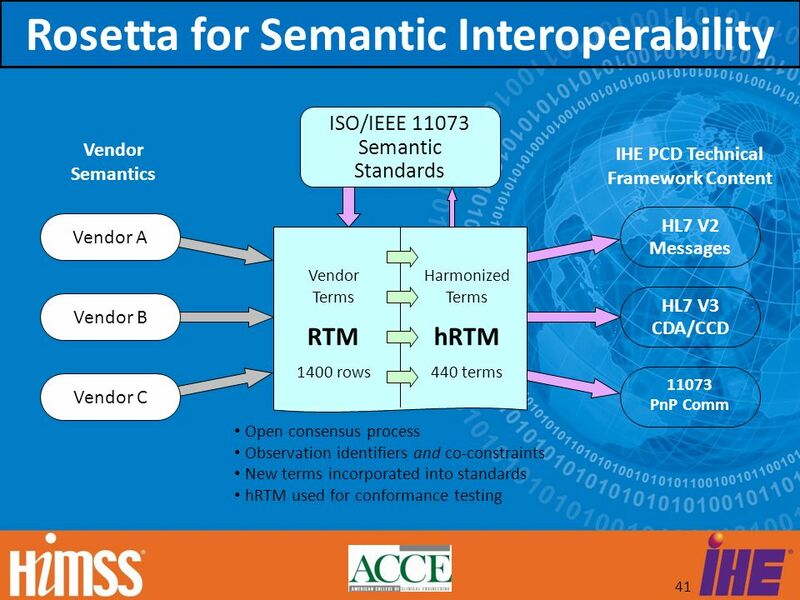 43 RTM & hRTM Highlights Unified semantics and semantic model are essential prerequisites for safe and effective interoperability between devices and systems. 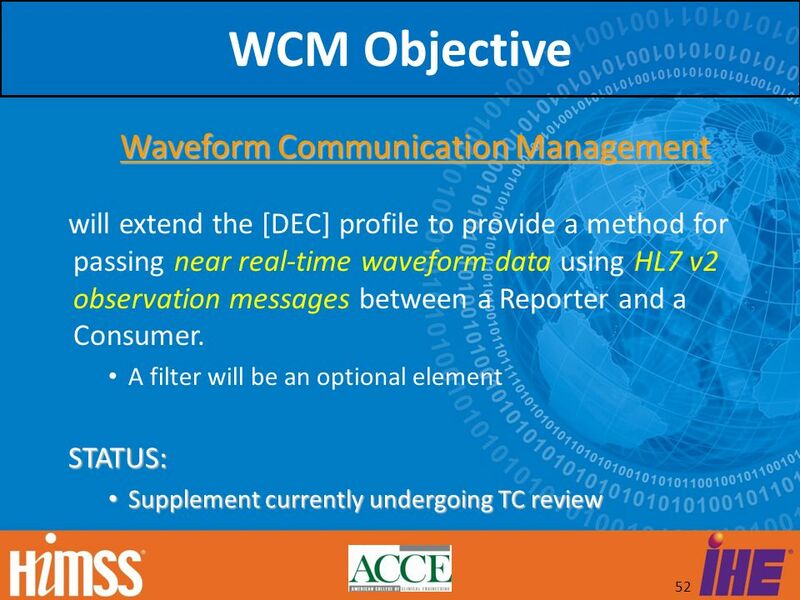 The hRTM rigorously defines what may be sent and informs recipients of what they may expect to receive. 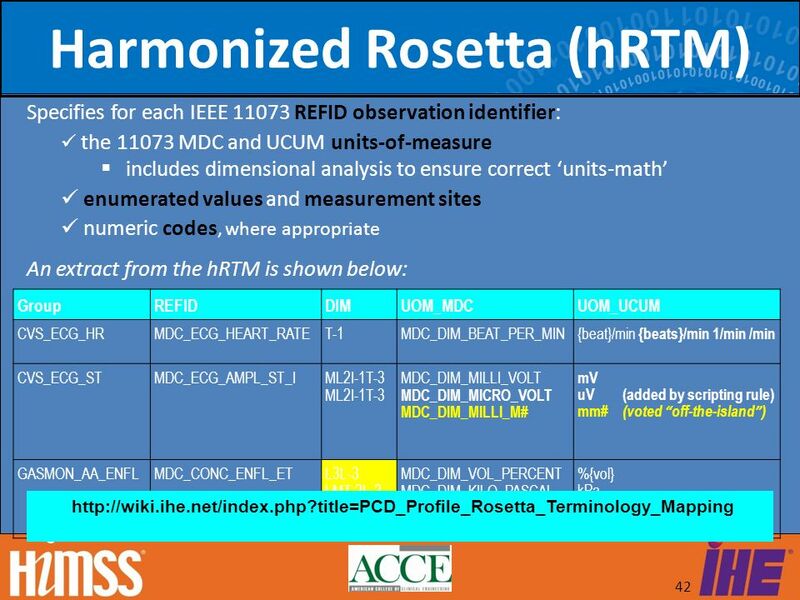 For each observation identifier, the hRTM specifies the units-of-measure, enumerated values, measurement sites and other co-constraints. 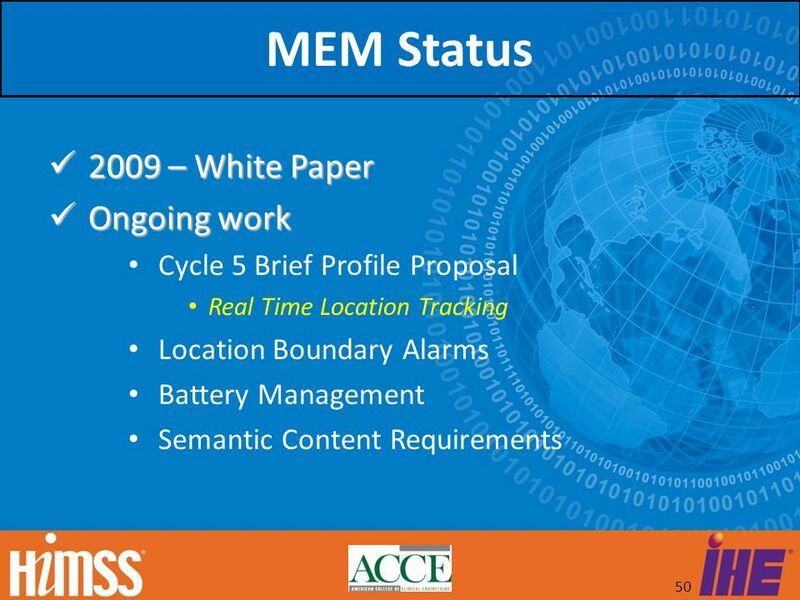 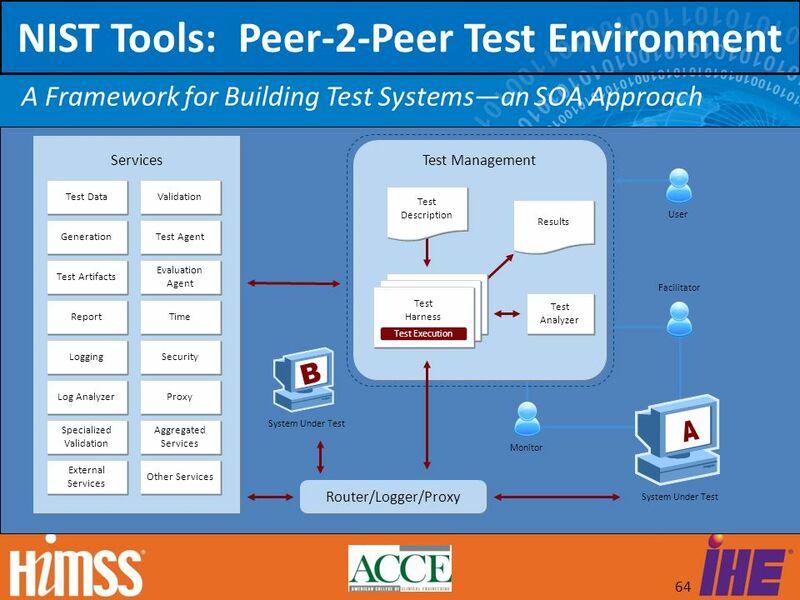 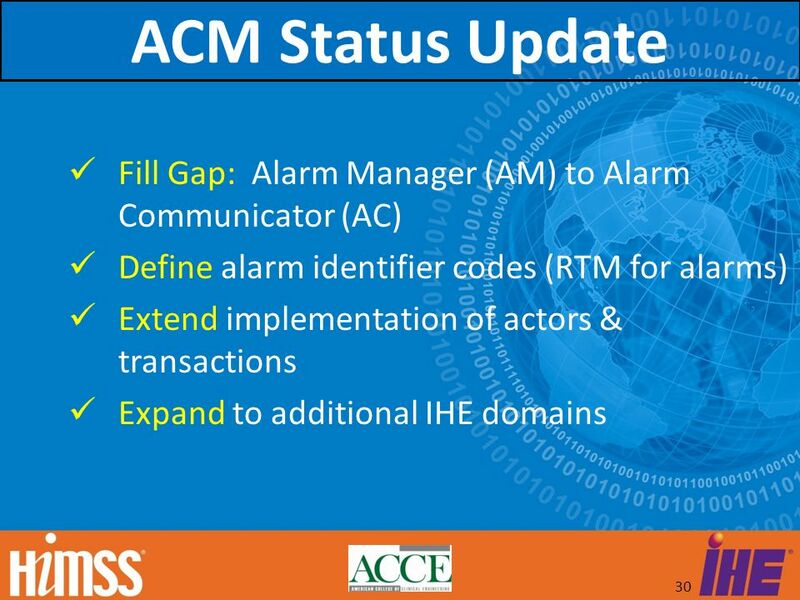 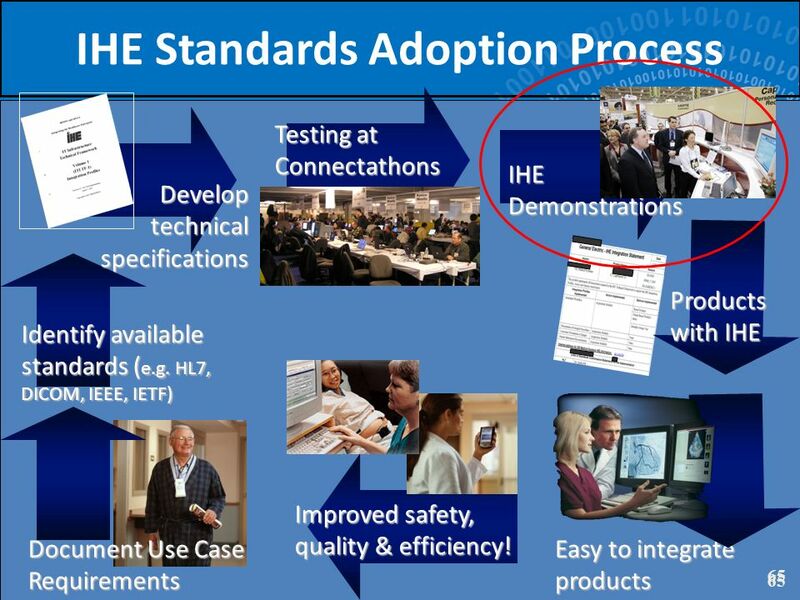 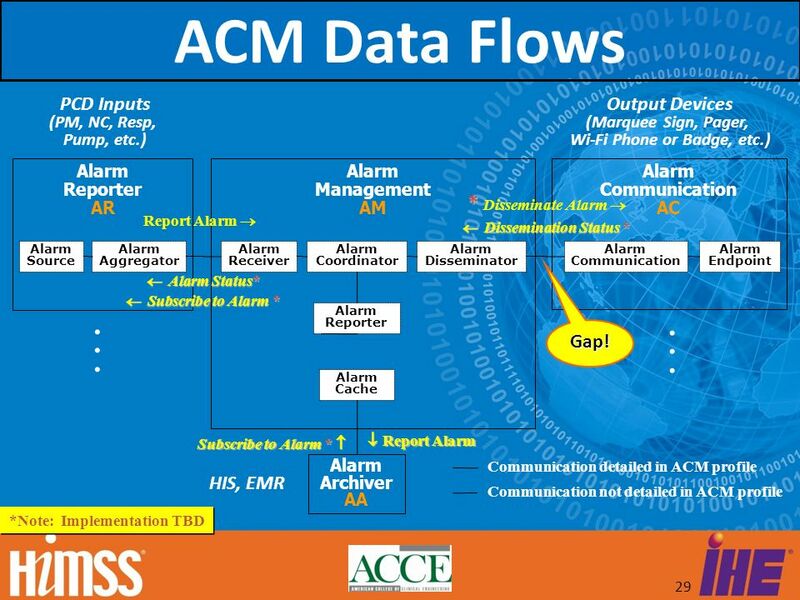 The hRTM is based on the ISO/IEEE standards and leverages and extends that work by using an open consensus process. 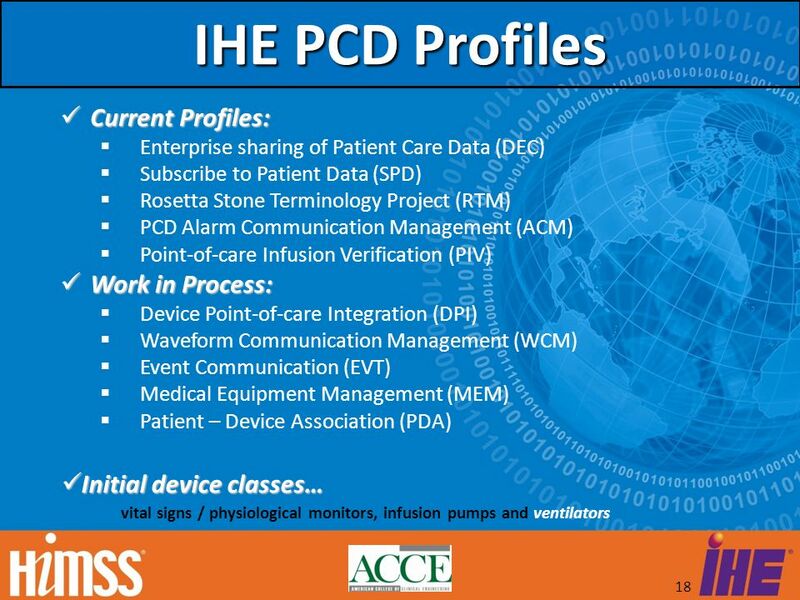 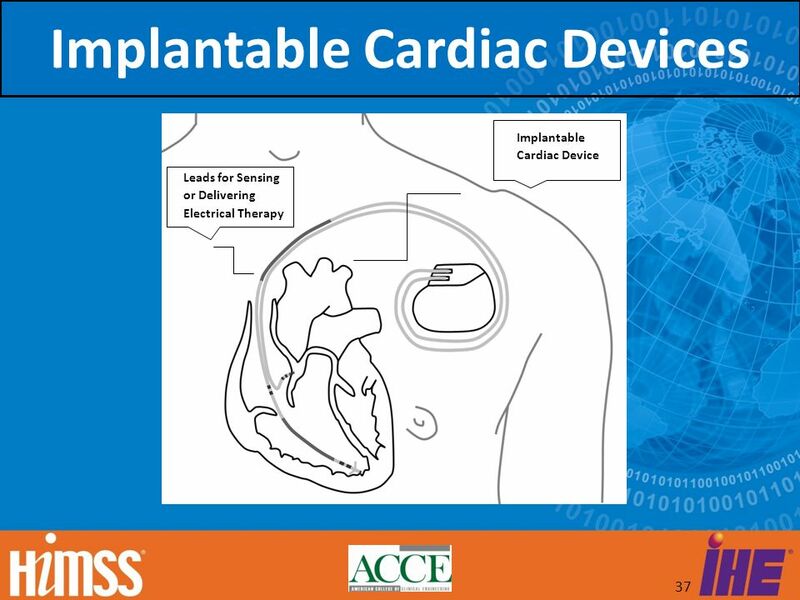 The hRTM is publicly available for IHE PCD clinical devices and will be available shortly for IEEE personal health devices. 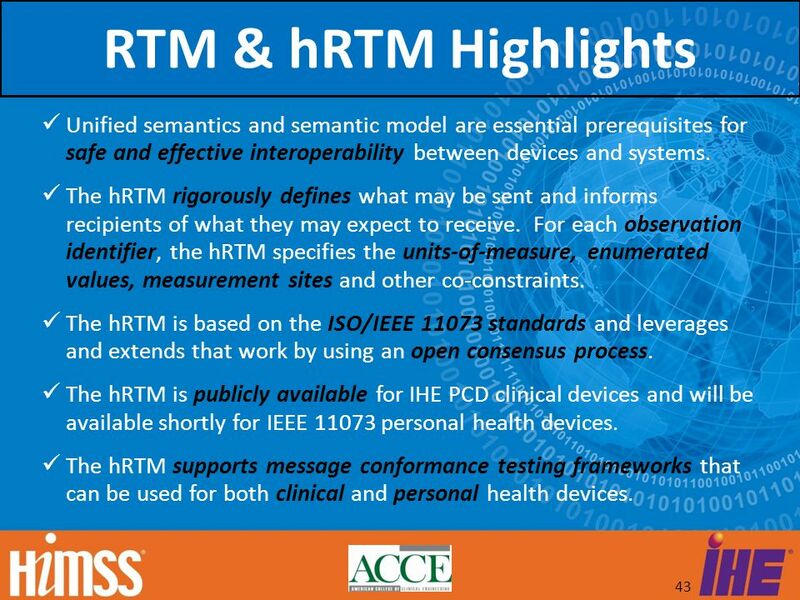 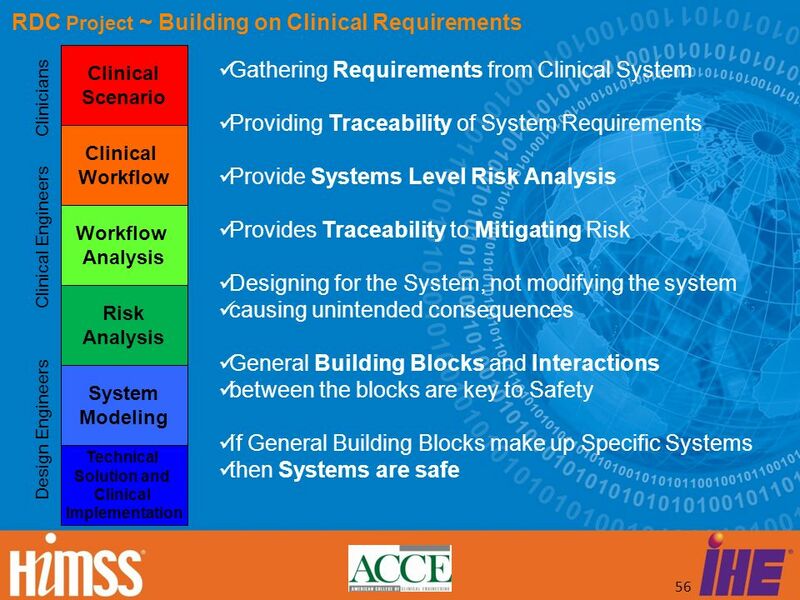 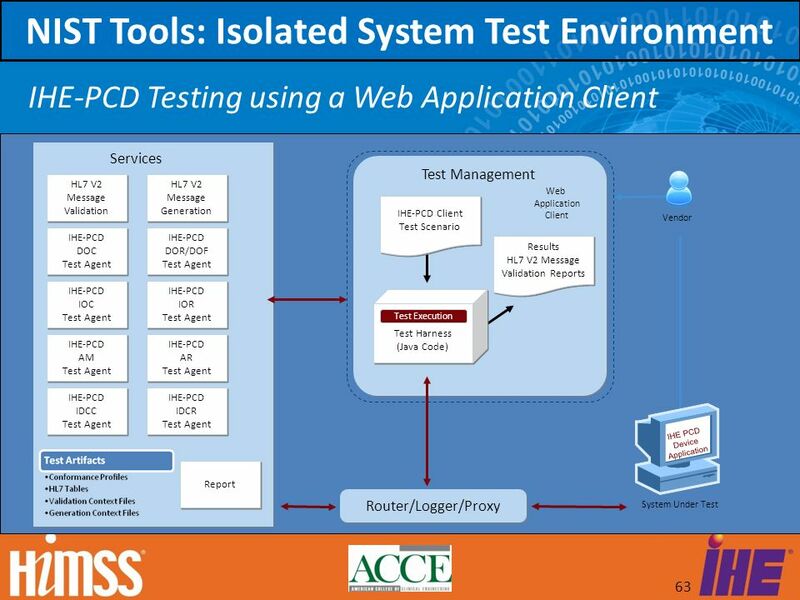 The hRTM supports message conformance testing frameworks that can be used for both clinical and personal health devices. 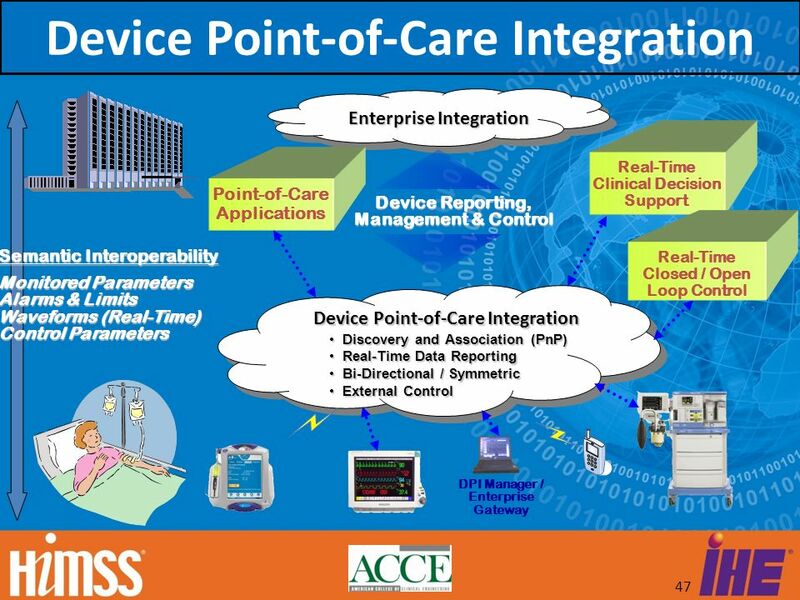 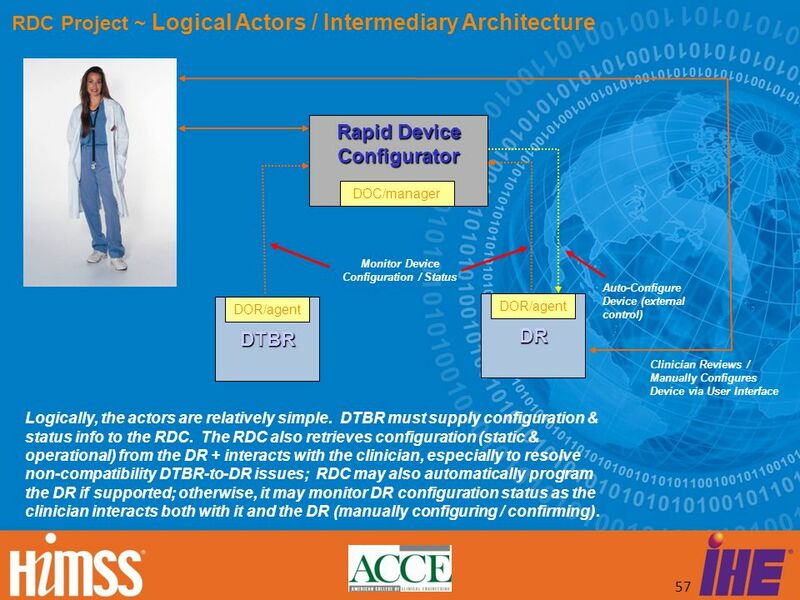 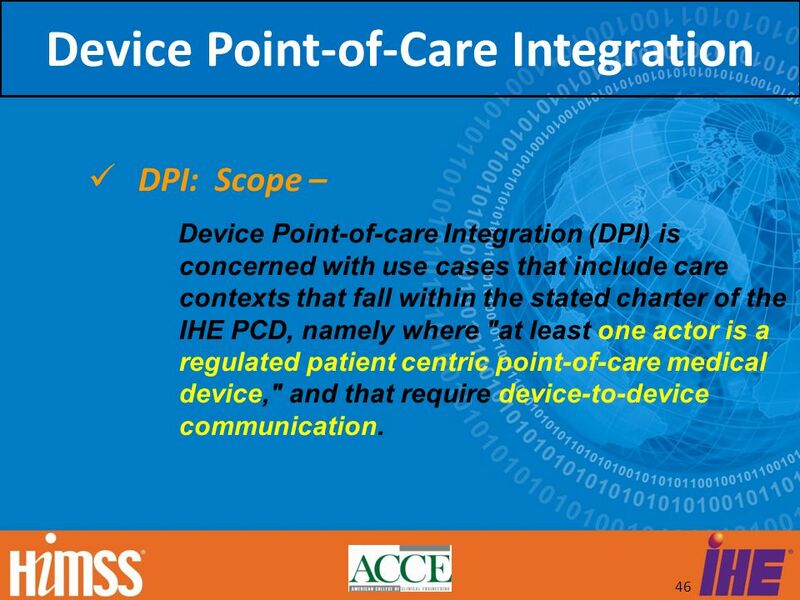 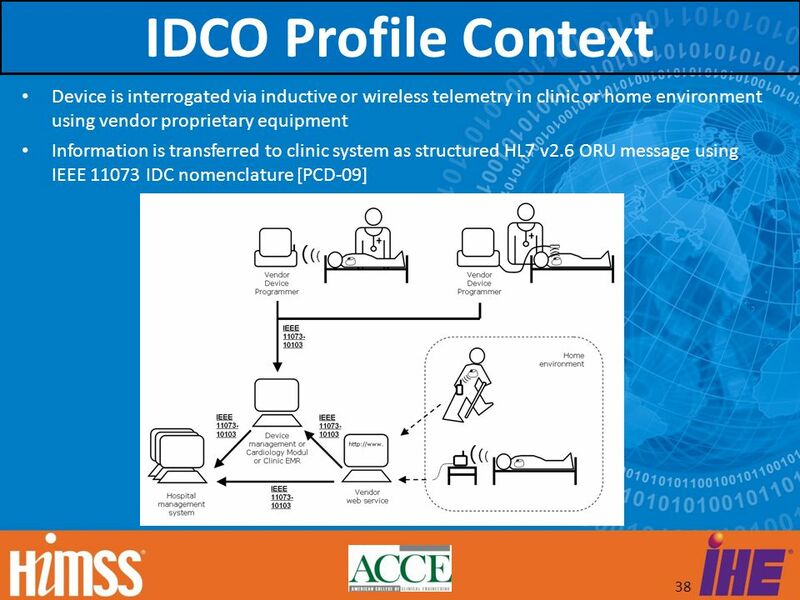 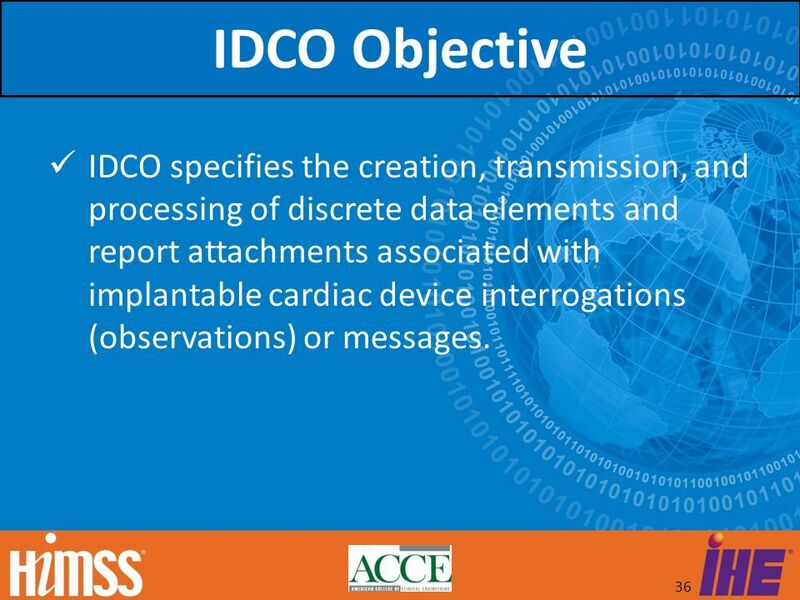 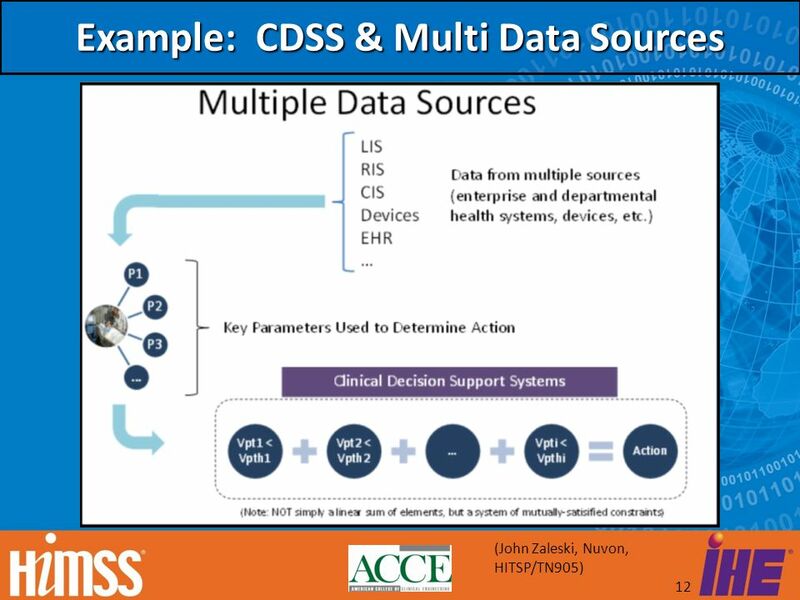 DPI: Scope – Device Point-of-care Integration (DPI) is concerned with use cases that include care contexts that fall within the stated charter of the IHE PCD, namely where "at least one actor is a regulated patient centric point-of-care medical device," and that require device-to-device communication. 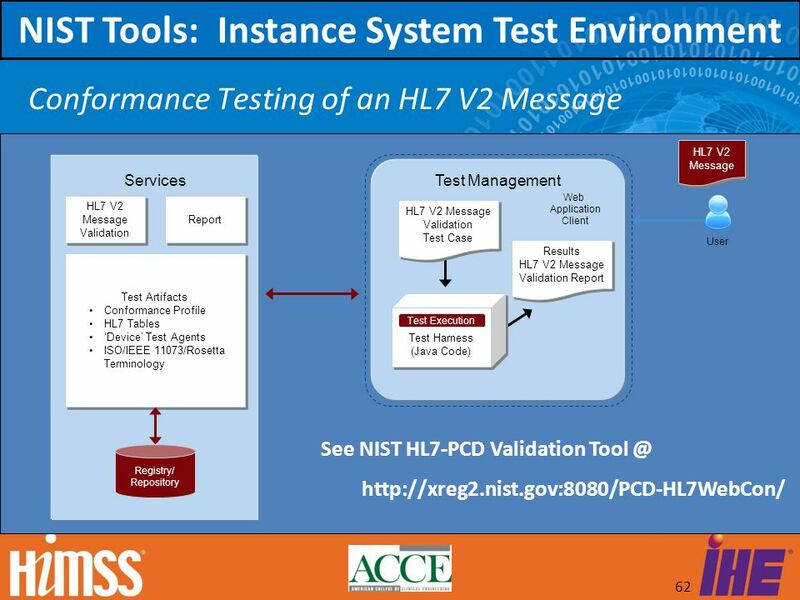 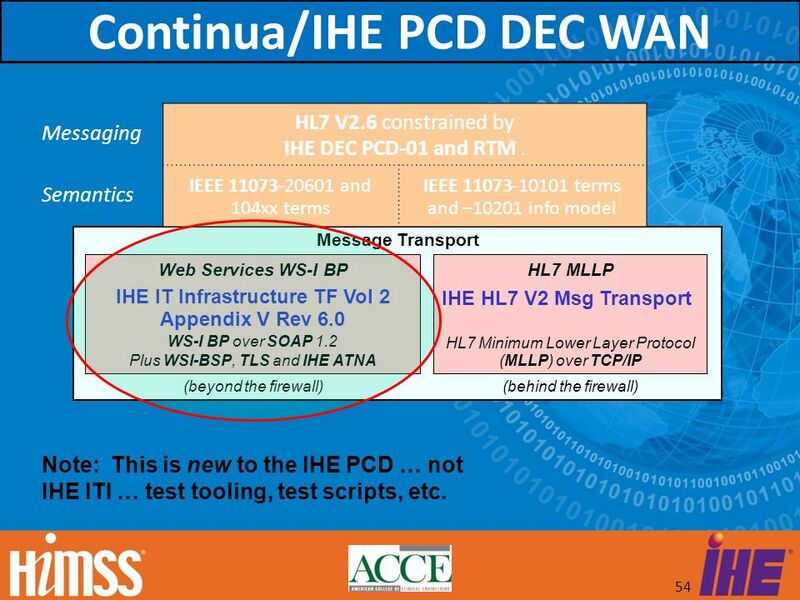 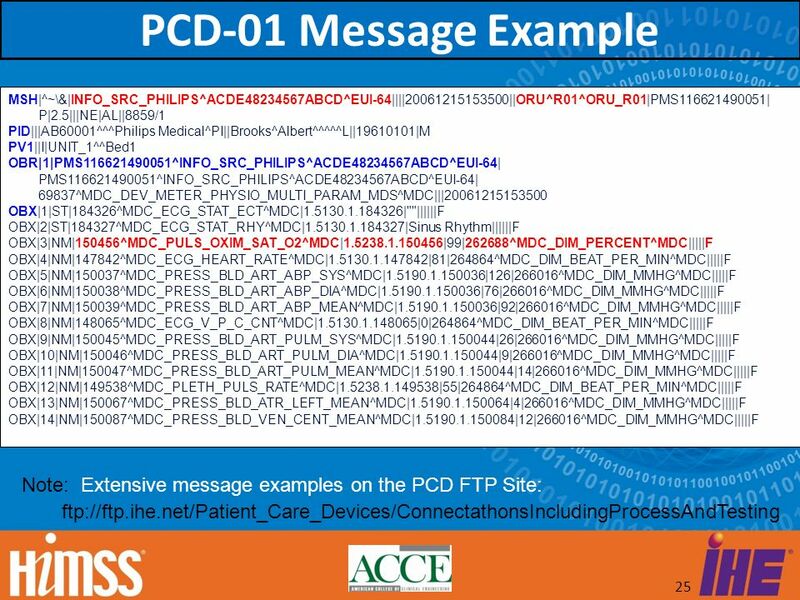 Messaging HL7 V2.6 constrained by IHE DEC PCD-01 and RTM . 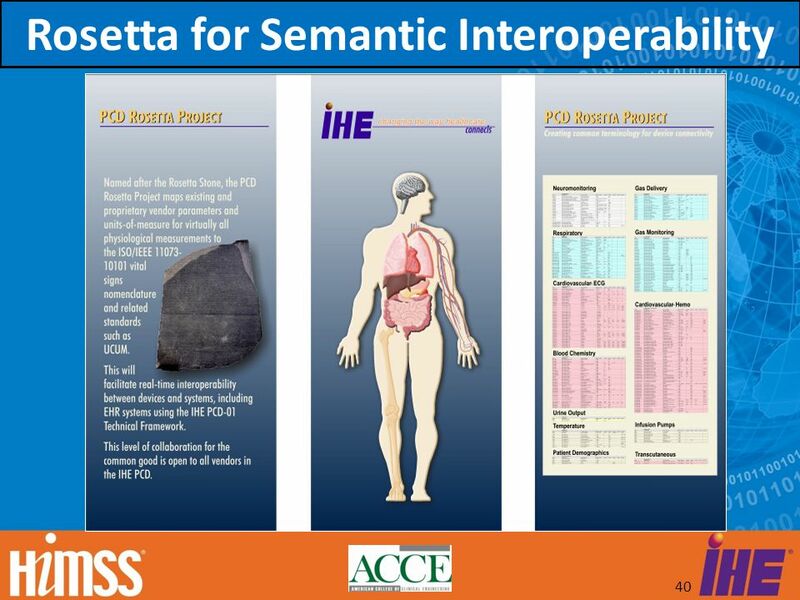 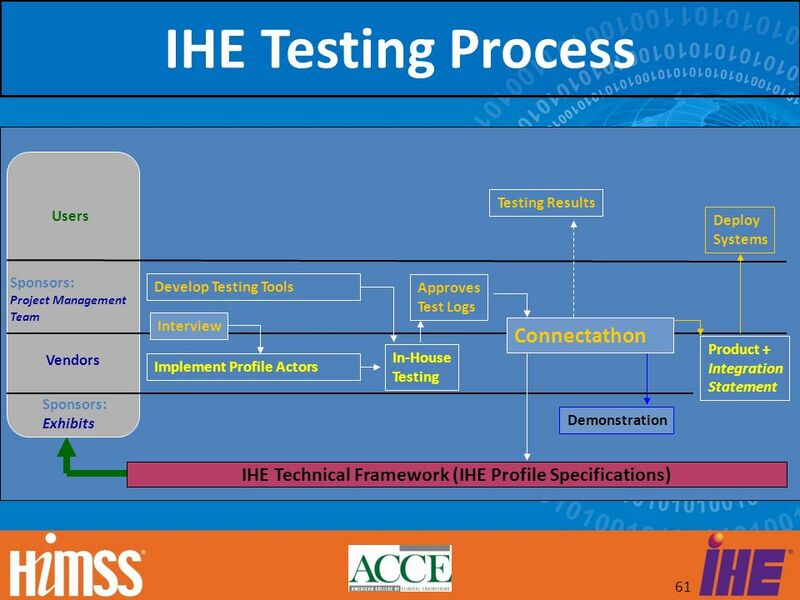 Semantics IEEE and 104xx terms IEEE terms and –10201 info model Message Transport Web Services WS-I BP IHE IT Infrastructure TF Vol 2 Appendix V Rev 6.0 WS-I BP over SOAP 1.2 Plus WSI-BSP, TLS and IHE ATNA HL7 MLLP IHE HL7 V2 Msg Transport HL7 Minimum Lower Layer Protocol (MLLP) over TCP/IP (beyond the firewall) (behind the firewall) Note: This is new to the IHE PCD … not IHE ITI … test tooling, test scripts, etc. 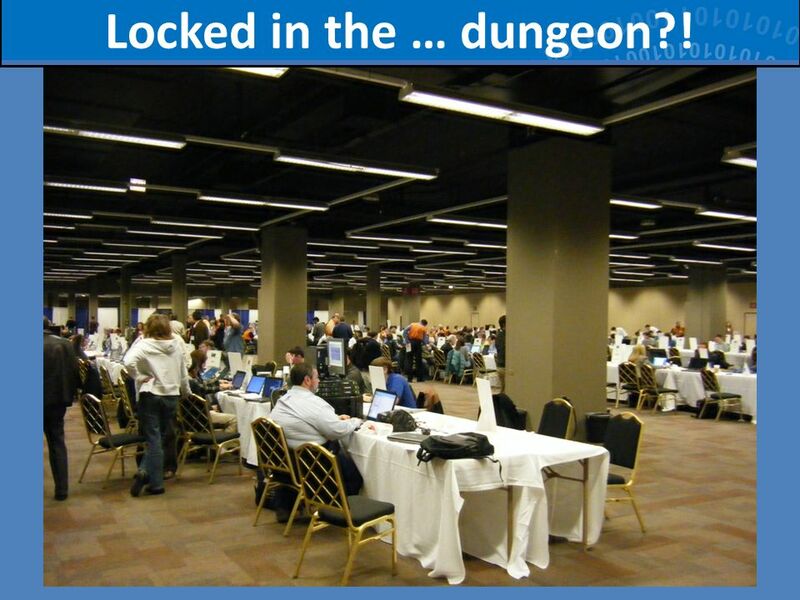 60 Locked in the … dungeon?! 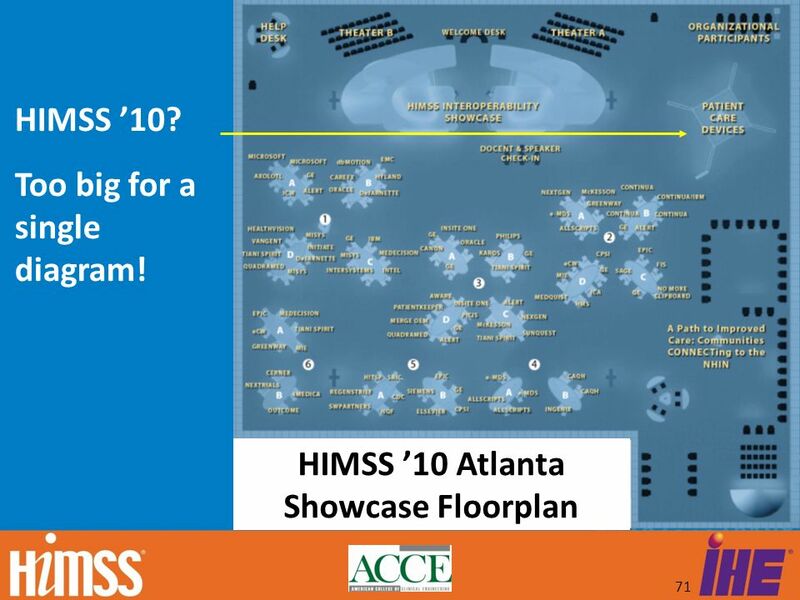 71 HIMSS ’10 Atlanta Showcase Floorplan HIMSS ’10? 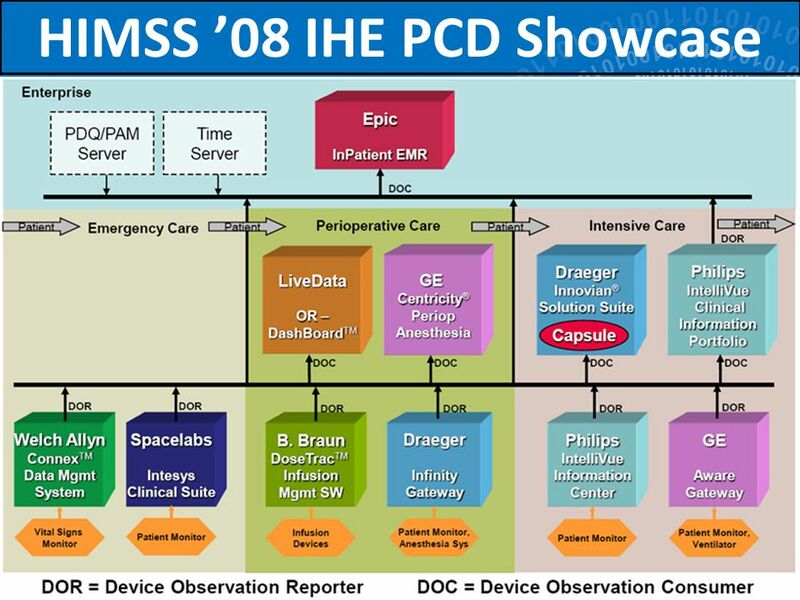 Too big for a single diagram! 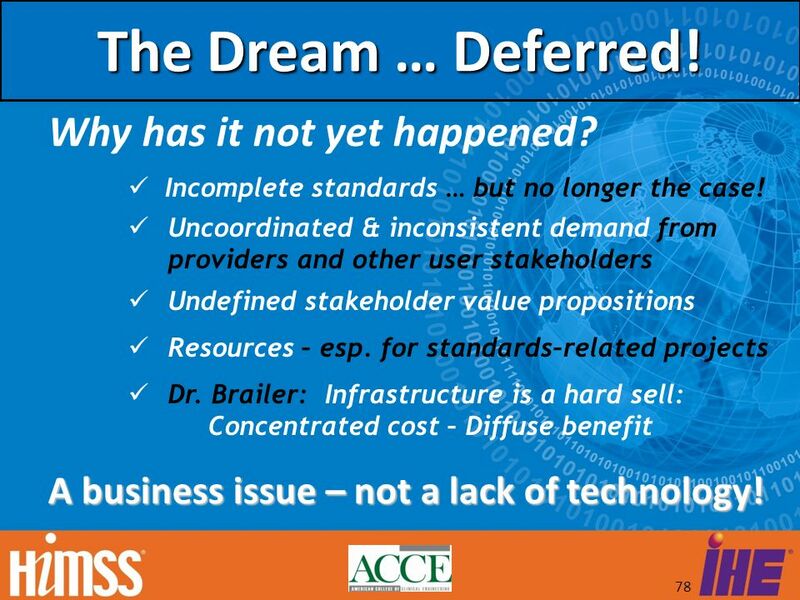 78 The Dream … Deferred! 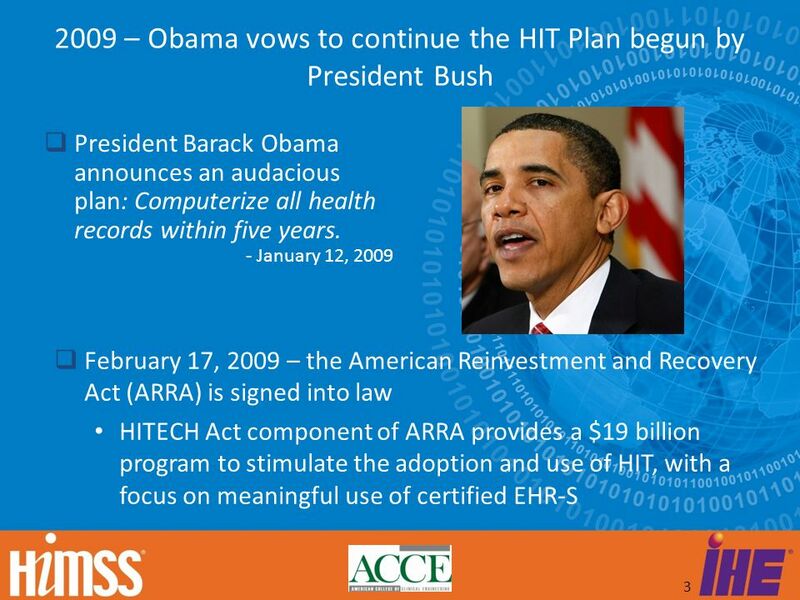 Why has it not yet happened? 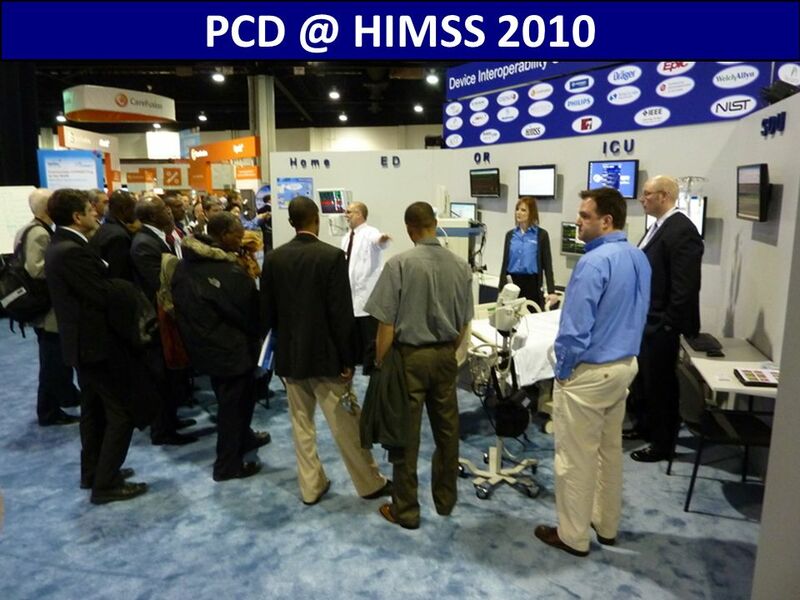 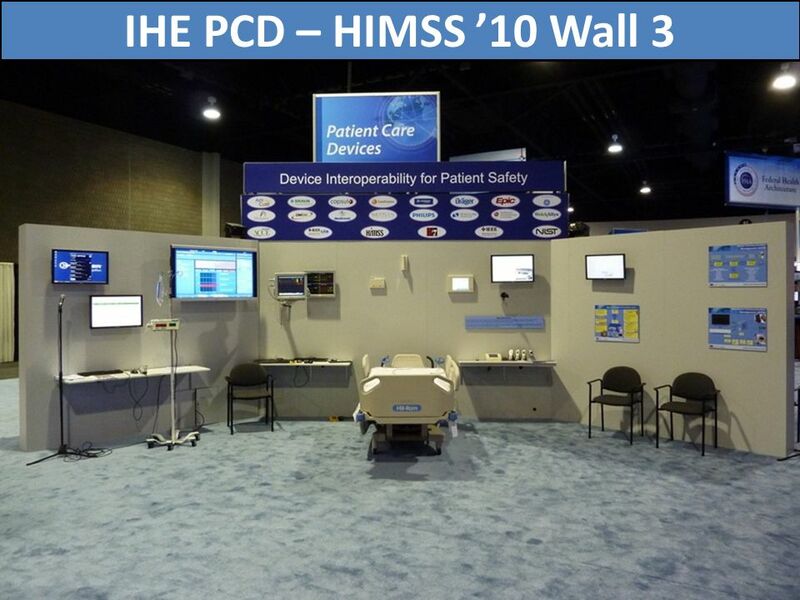 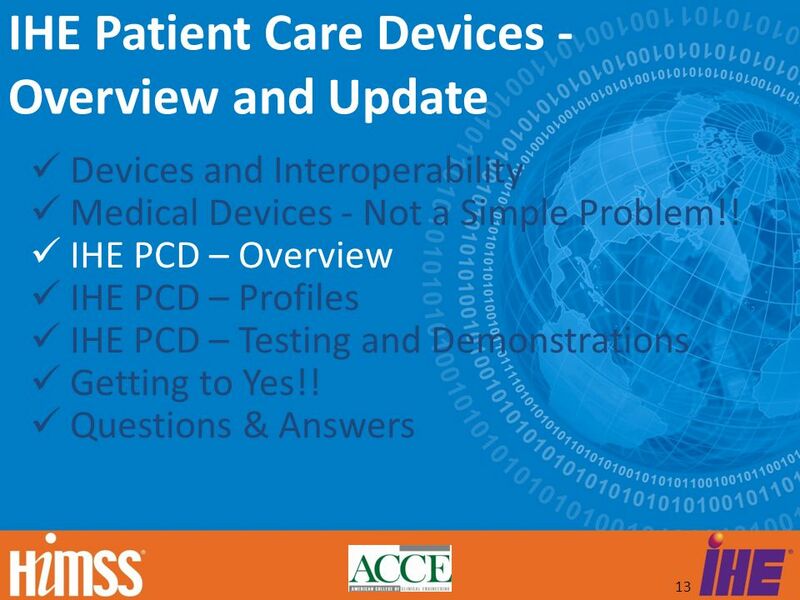 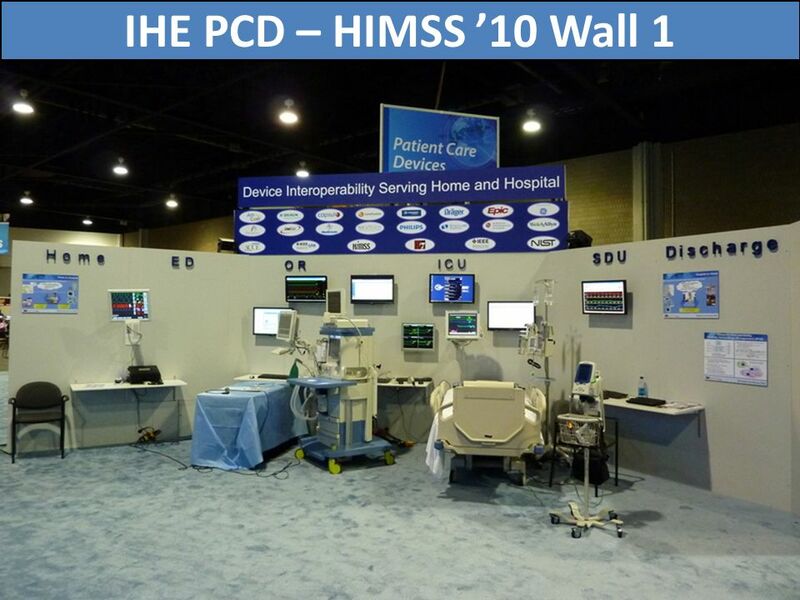 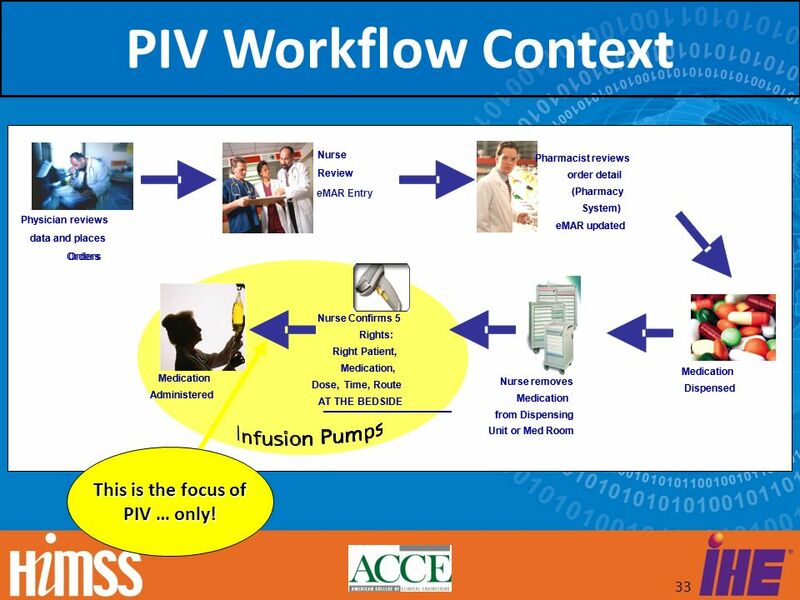 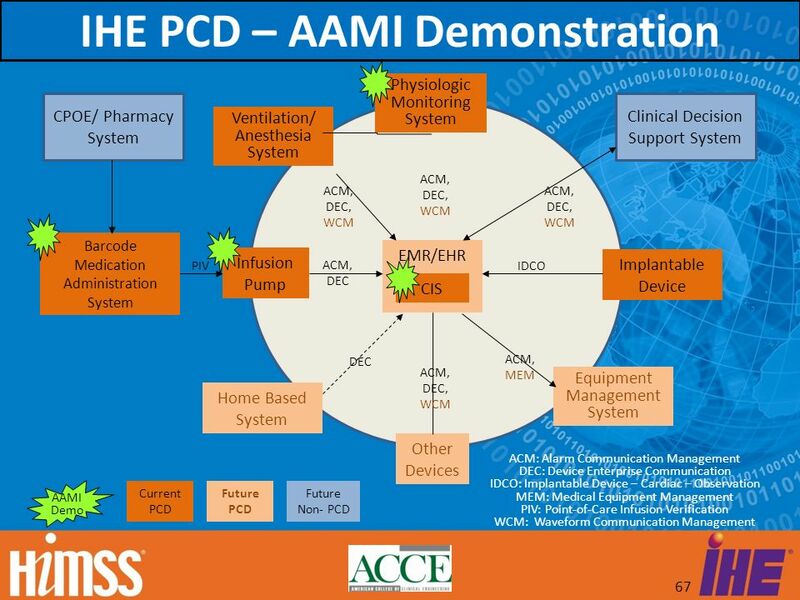 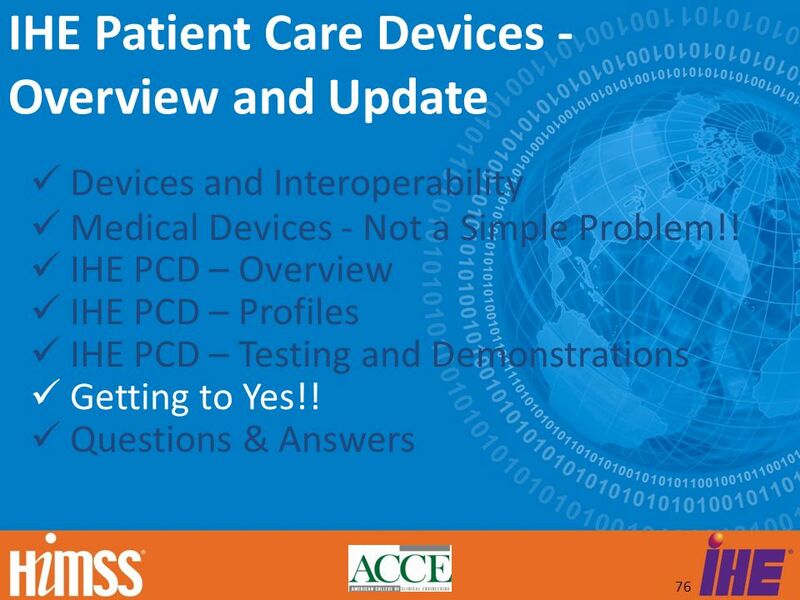 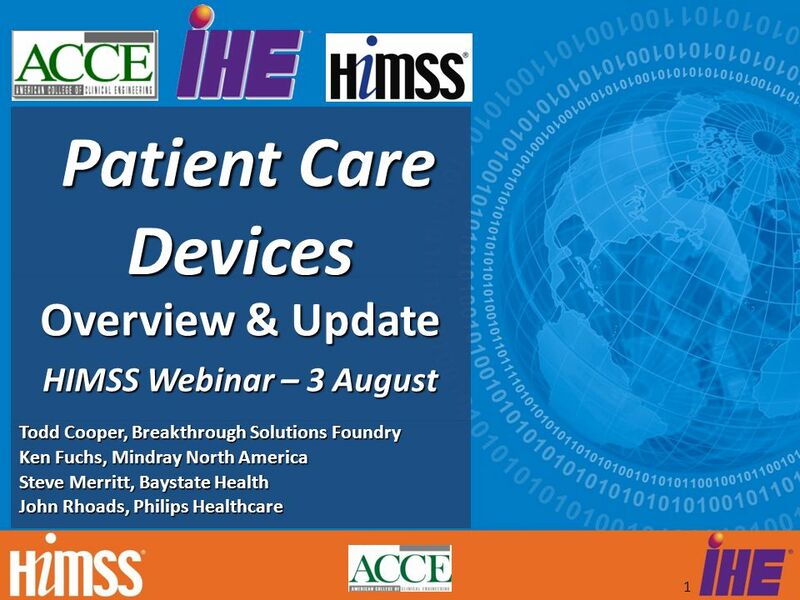 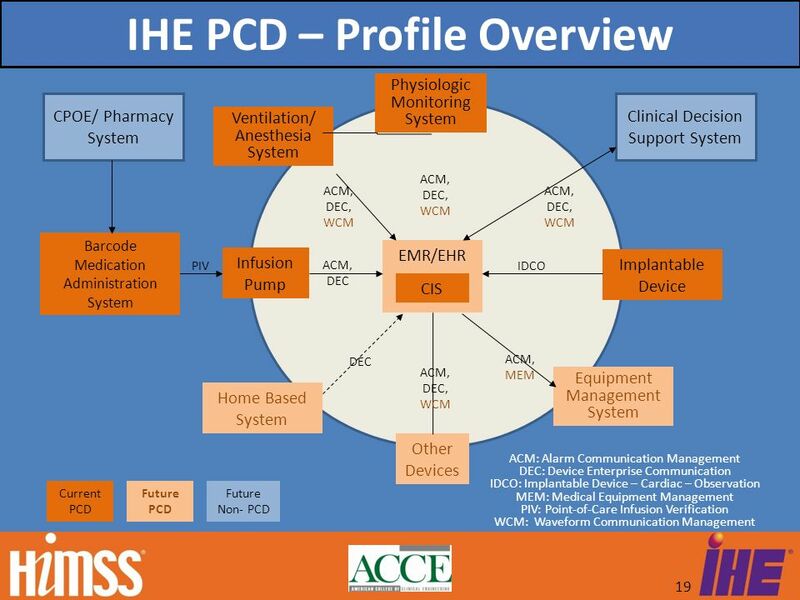 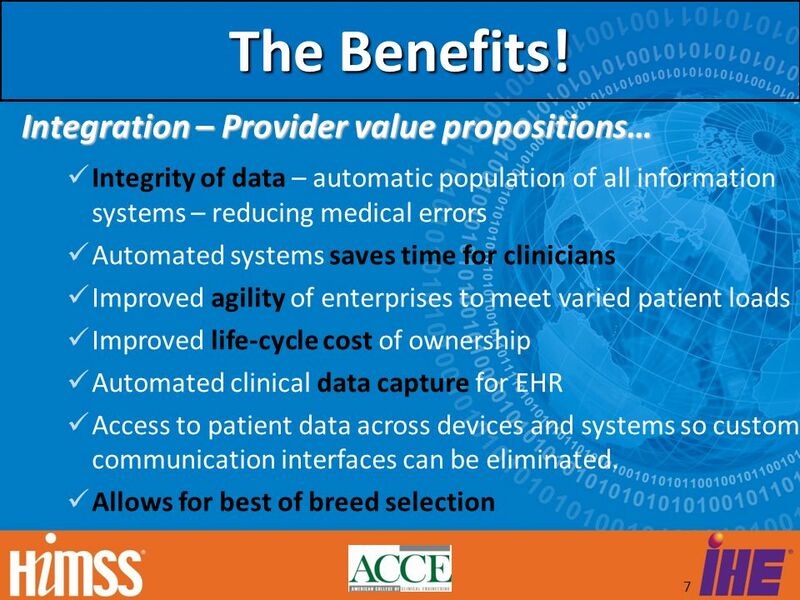 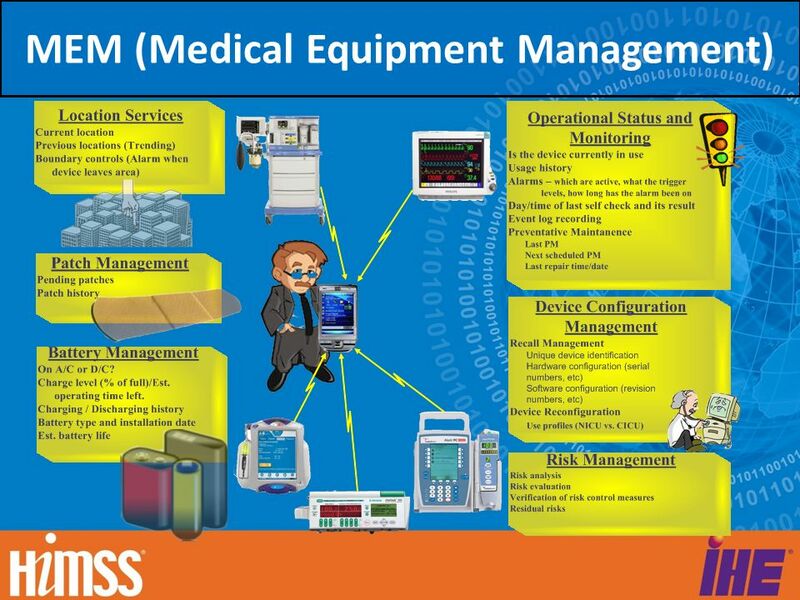 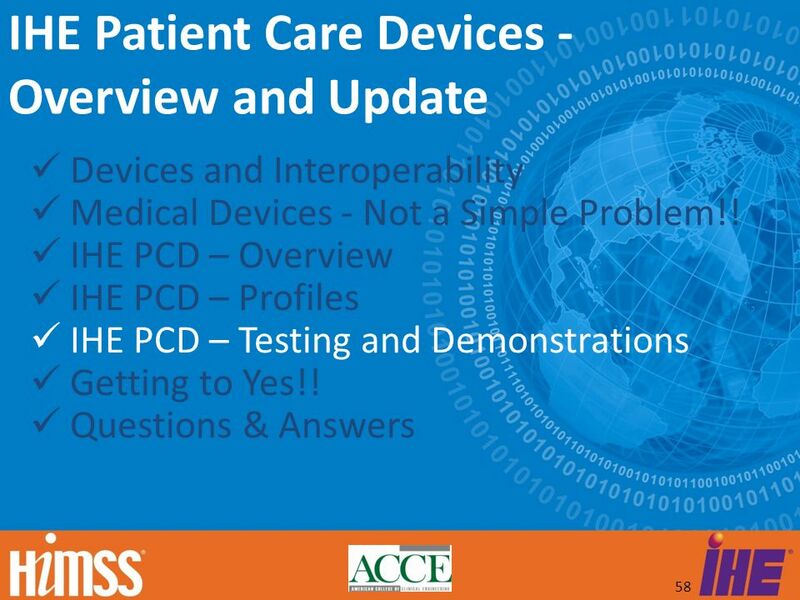 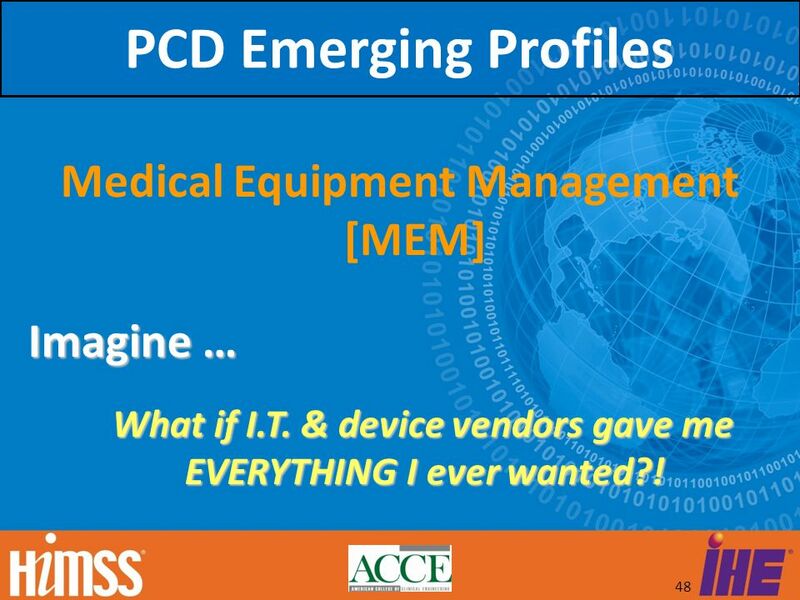 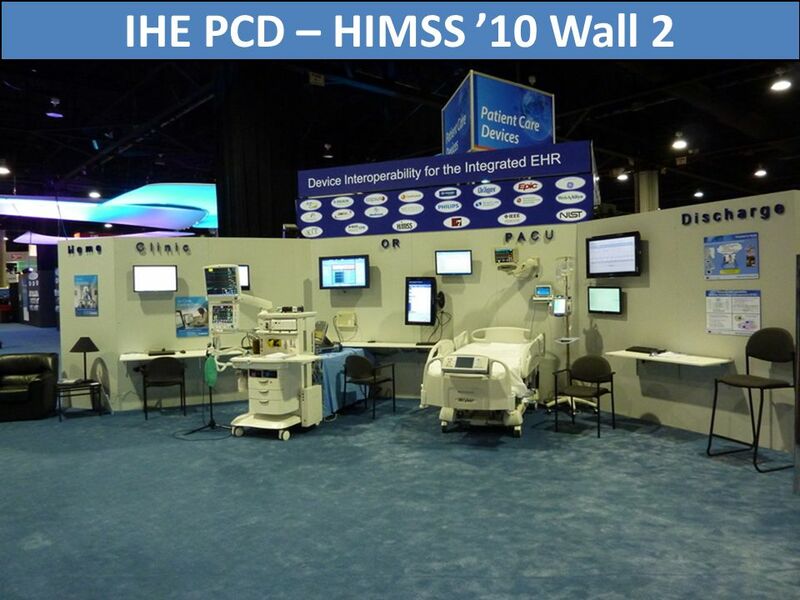 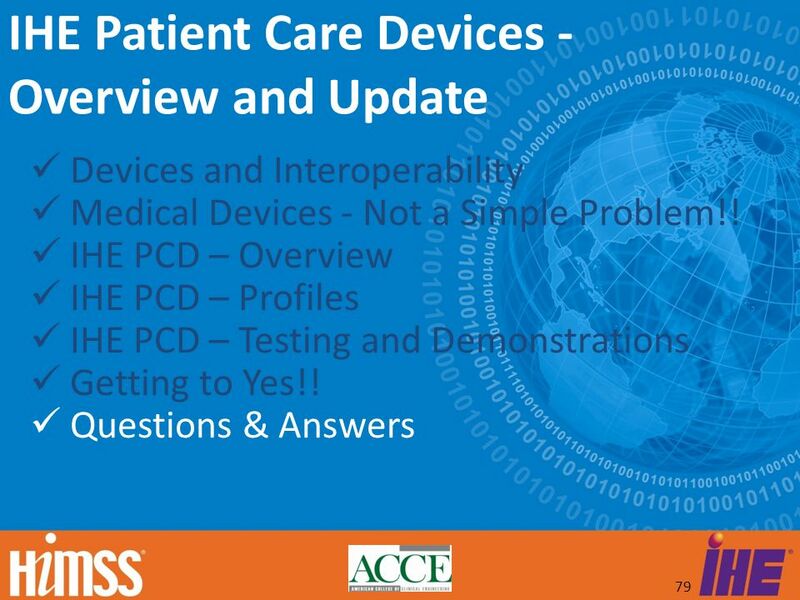 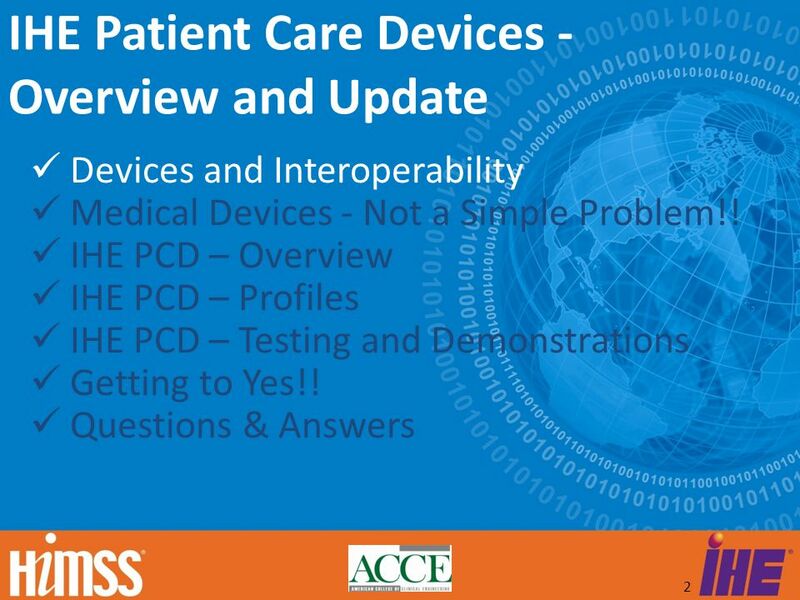 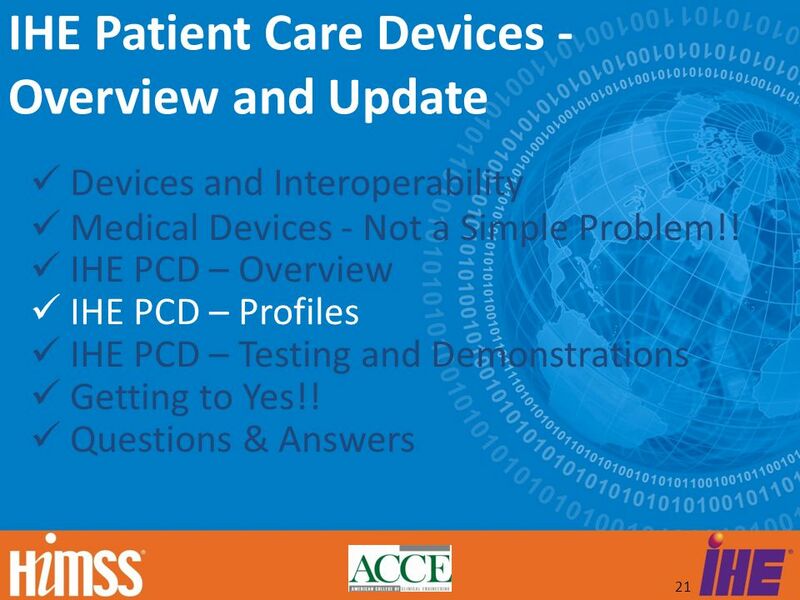 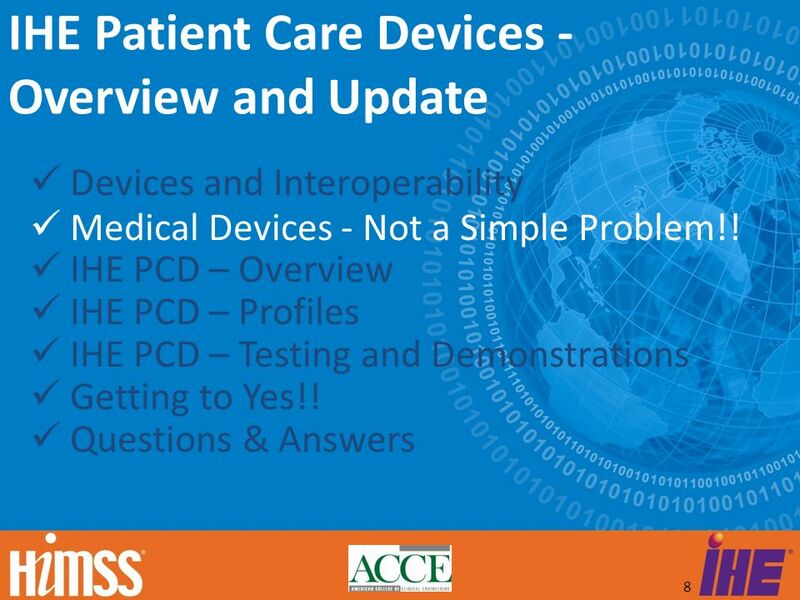 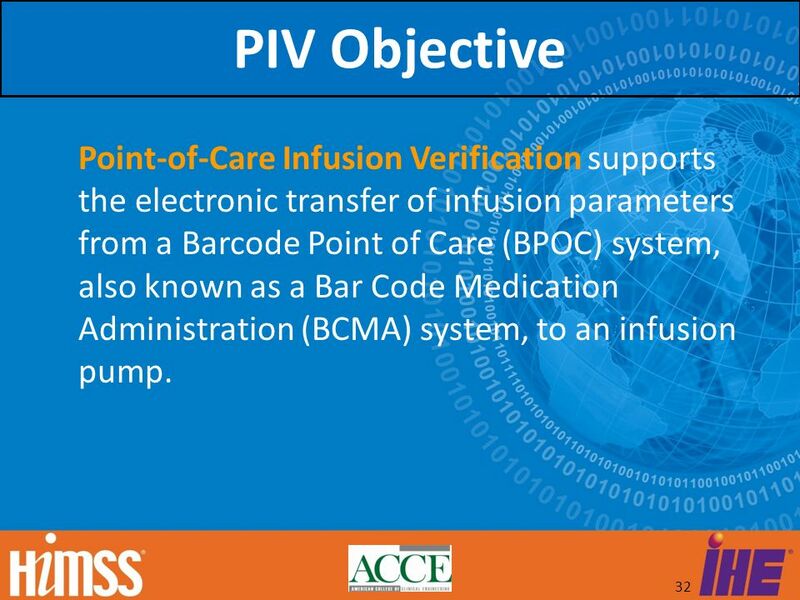 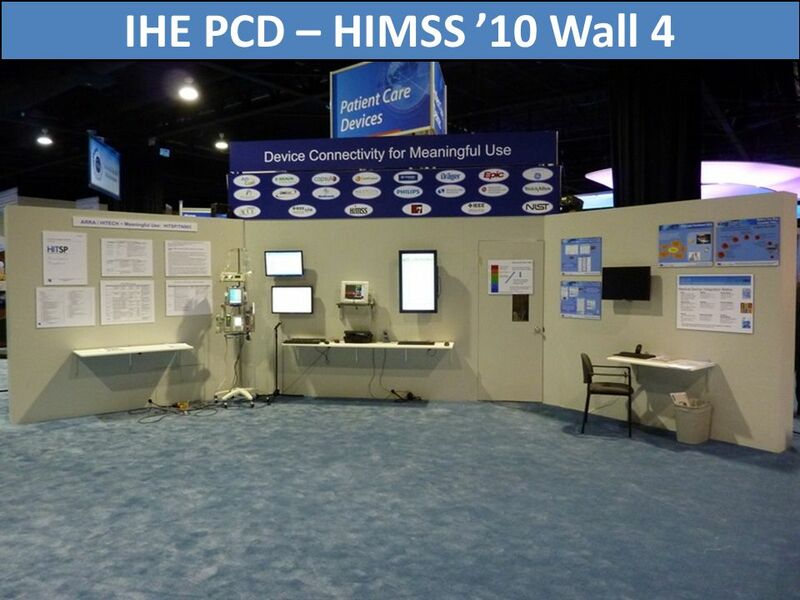 Download ppt "Overview & Update HIMSS Webinar – 3 August"
Patient Care Devices IHE North America 2009 Showcase Participant Workshop Todd Cooper, Breakthrough Solutions Co-Chair, IHE PCD Technical Committee Manny. 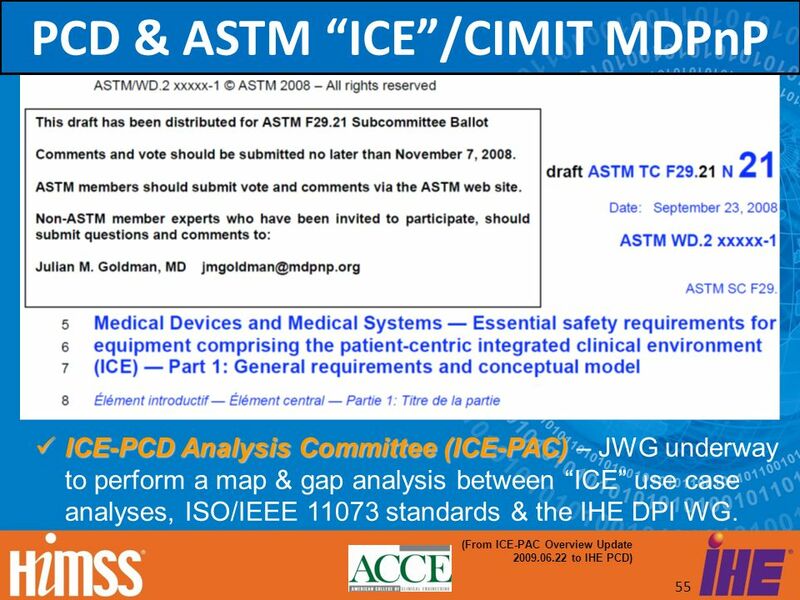 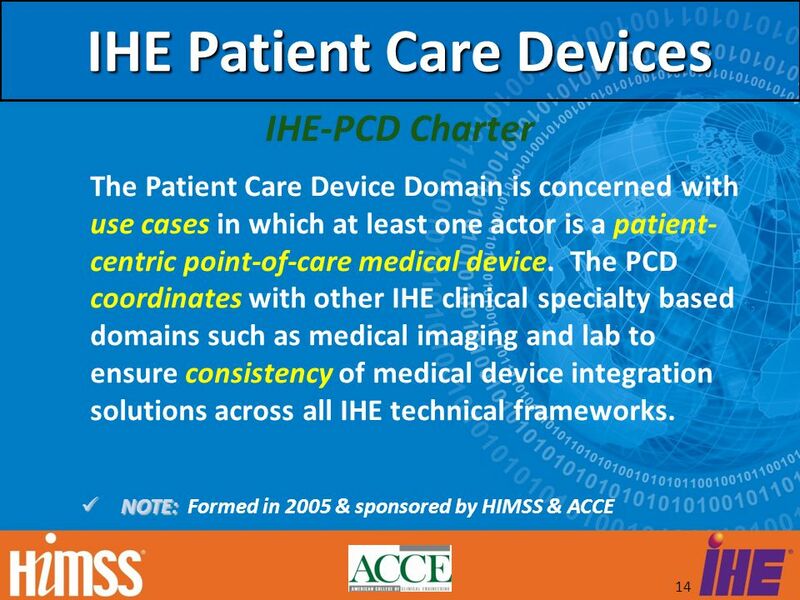 September, 2005What IHE Delivers 1 Todd Cooper Co-Chair, ACCE IHE Patient Care Devices Domain Co-Chair, ACCE IHE Patient. 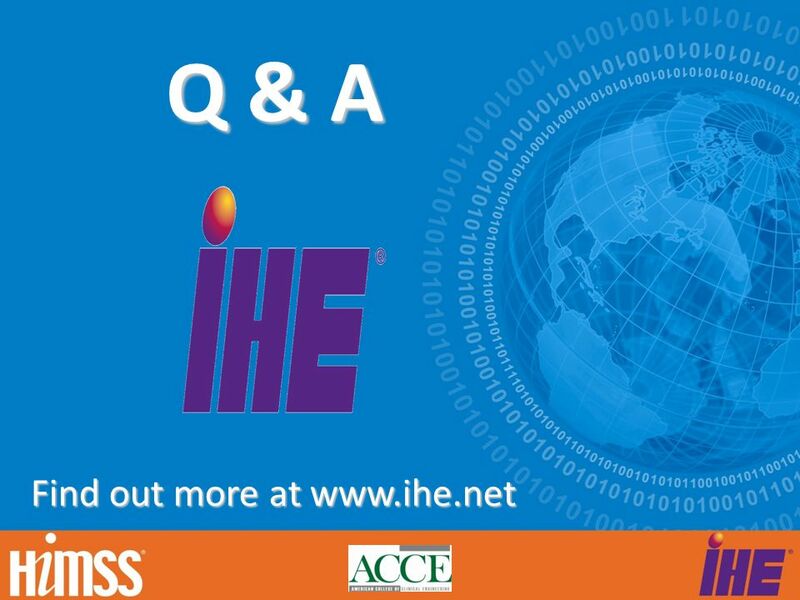 IHE An Introduction for Source Atlantic. 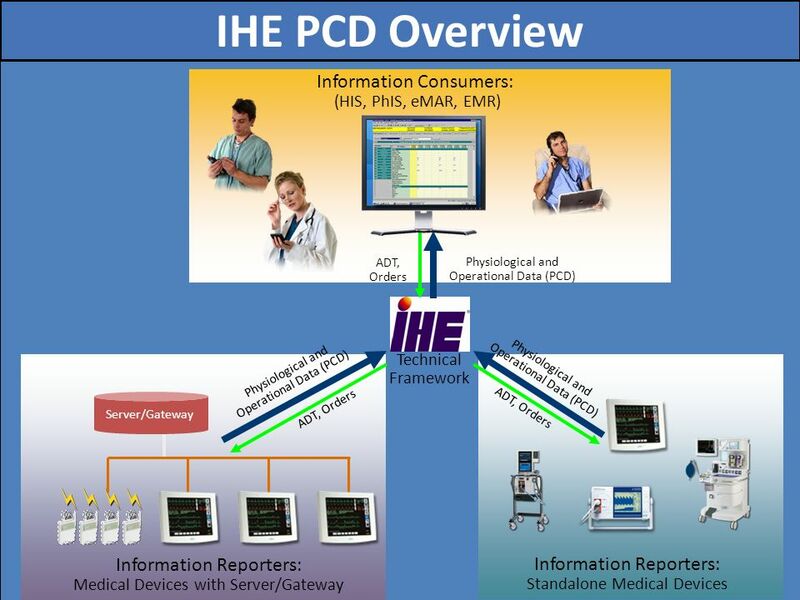 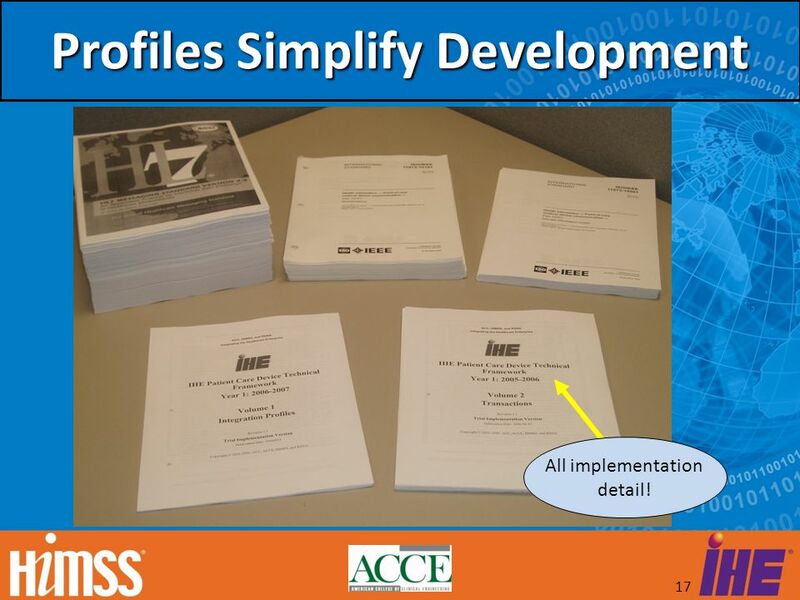 IHE PCD: Simplify Specs! 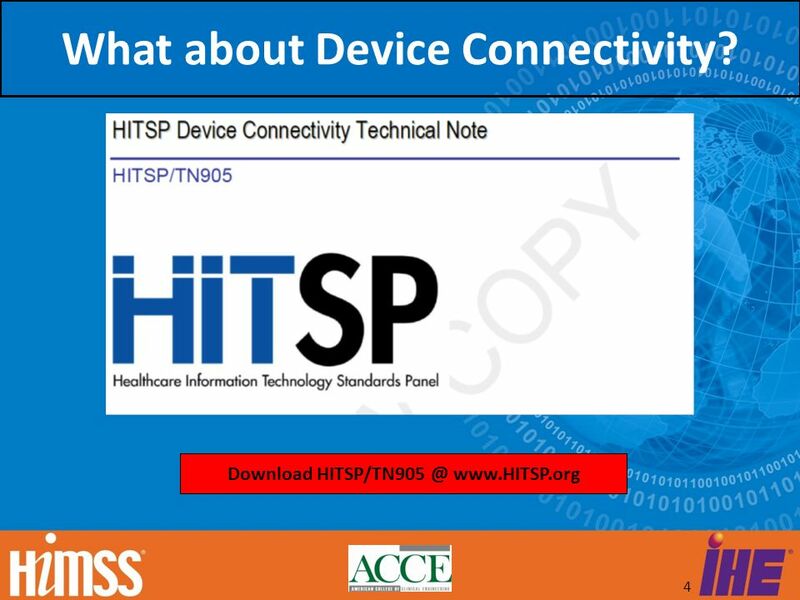 Use of IHE DEC Profiles for Remote Monitoring Authors: Paul Schluter and Todd Cooper HITSP RMON discussion October 2, 2008. 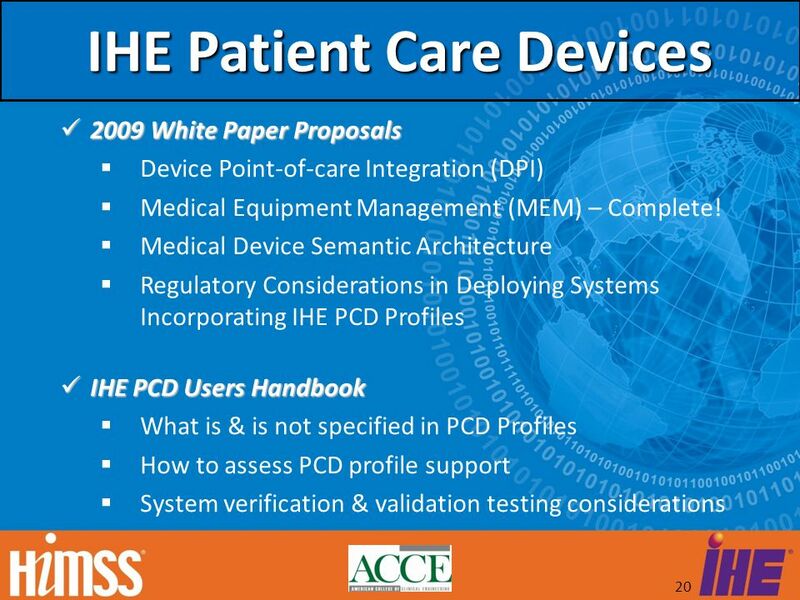 Potential Posters for HIMSS11 PCD and Continua; Integration of home, personal and regulated medical devices. 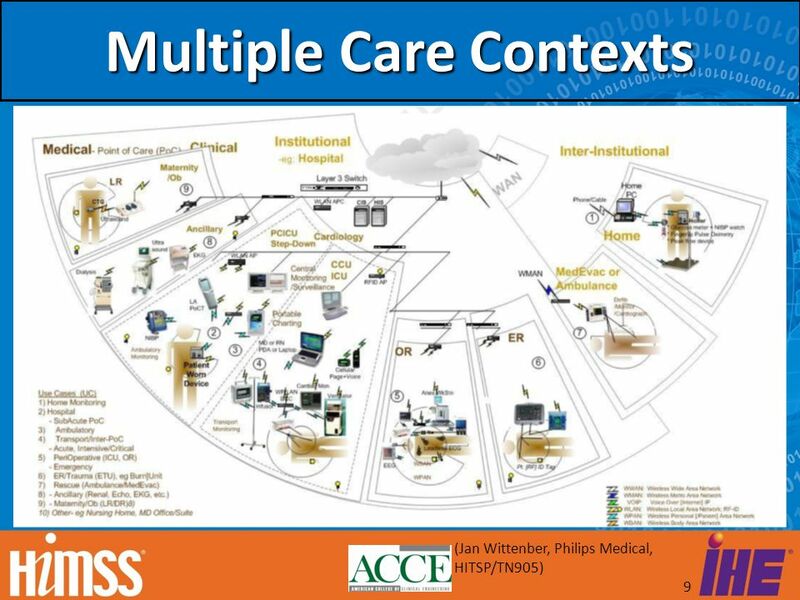 Quality, Research, and Public Health (QRPH) IHE North America Webinar Series 2009. 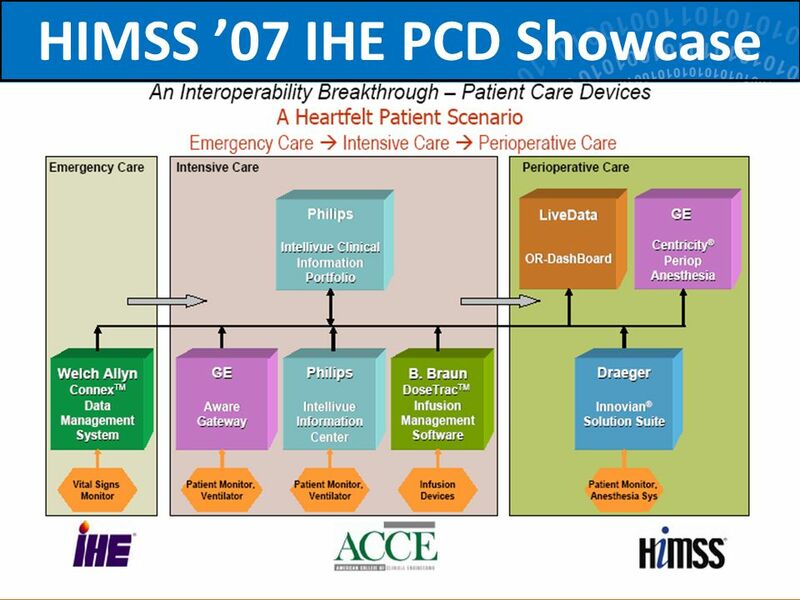 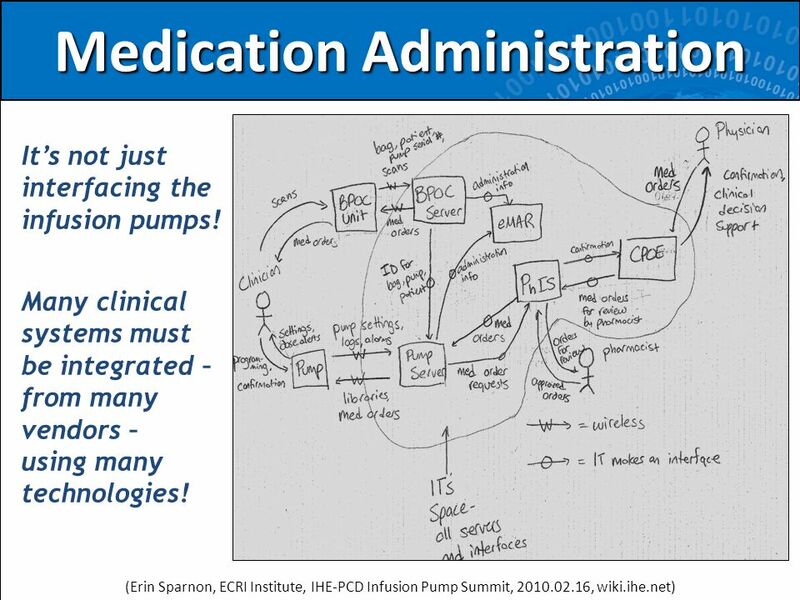 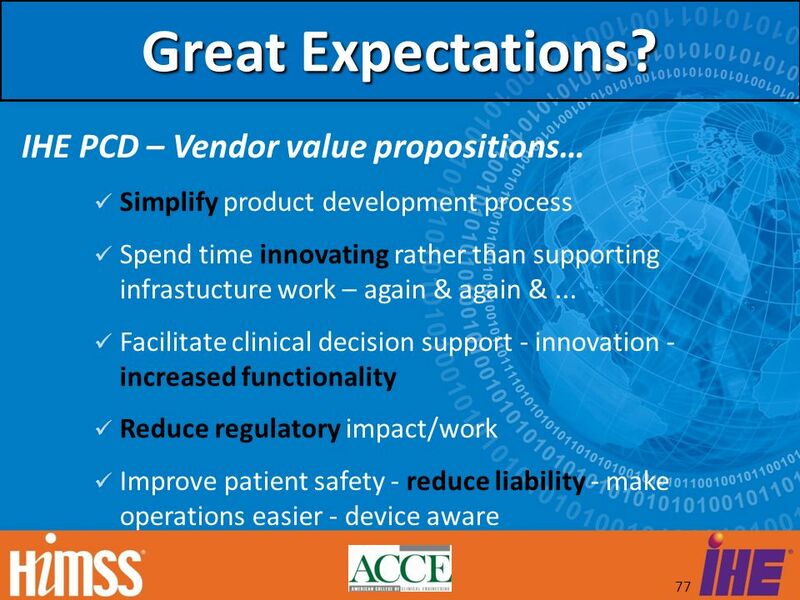 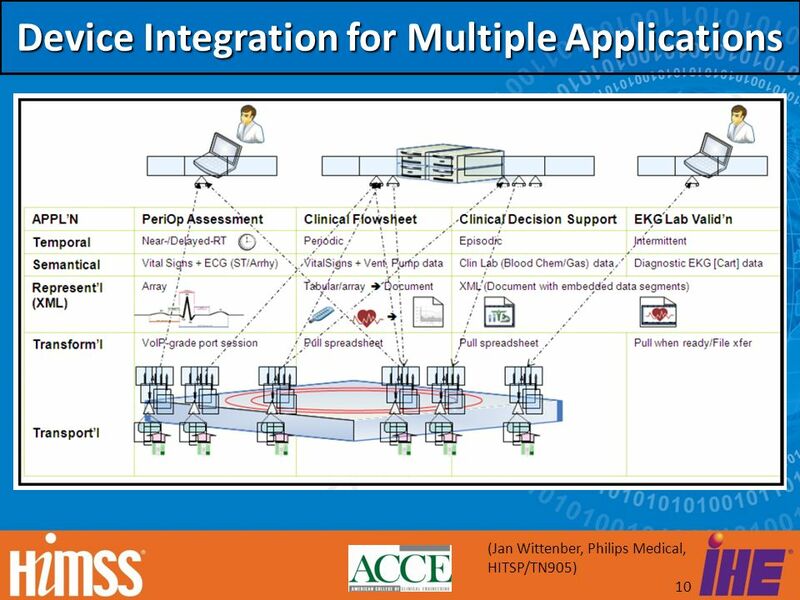 Pathfinding Session: Device Integration IHE North America Webinar Series 2008 Todd Cooper Patient Care Device Domain Breakthrough Solutions Foundry, Inc.
What is the End-Goal? 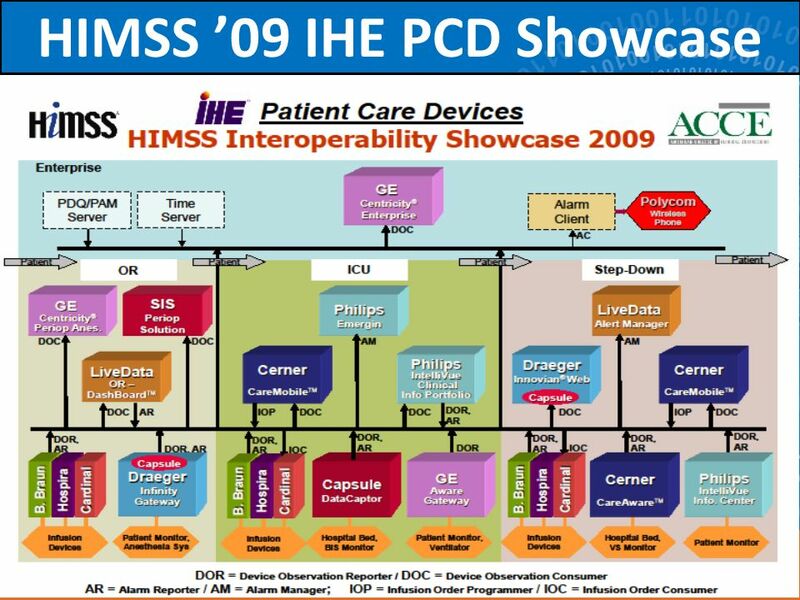 Interoperability? 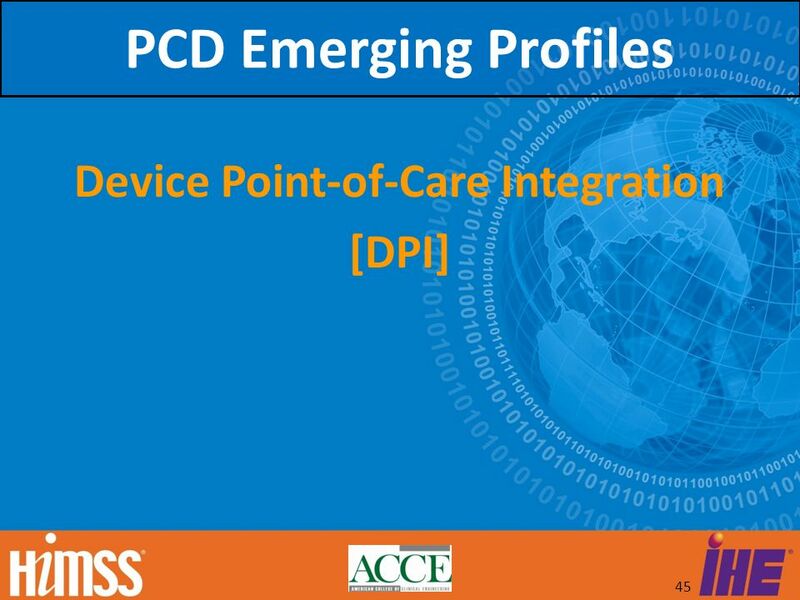 Integration? 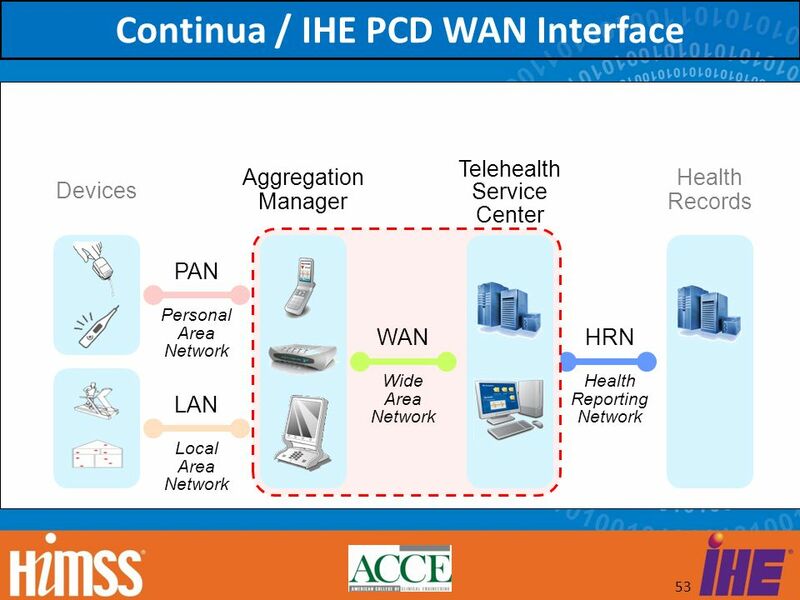 Connectivity?